JMA reported that vigorous fumarolic activity on the S side of Iwo-yama (also called Ioyama), on the NW flank of the Karakuni-dake stratovolcano in the Kirishimayama volcano group, continued during 30 November-3 December. Fumarolic plumes rose 100 m above the vent, and hot mud was ejected from the vent. A hot pool of water persisted on the S side of the area. Fumarolic plumes rose 50 m above a vent 500 m W of Iwo-yama. The Alert Level remained at 2 (the second lowest level on a scale of 1-5). JMA reported that during 23-30 July white fumarolic plumes rose 300-500 m above a vent on the S side of Iwo-yama (also called Ioyama, NW flank of Karakuni-dake), a stratovolcano of the Kirishimayama volcano group. A hot pool of water was visible on the S side, and muddy water flowed down the W side. The Alert Level remained at 3 (on a scale of 1-5). JMA reported that at Shinmoedake (Shinmoe peak), a stratovolcano of the Kirishimayama volcano group, an event at 1534 on 27 June generated a plume that rose 2.2 km above the crater rim. The report stated that since the beginning of May the rate of deformation had slowed, and tiltmeter data showed no change. In addition, sulfur dioxide emissions had decreased from 1,000 tons/day on mid-March to 80 tons/day on 1 June. On 28 June the Alert Level was lowered to 2 (on a scale of 1-5). JMA reported that at Shinmoedake (Shinmoe peak), a stratovolcano of the Kirishimayama volcano group, an explosive eruption at 0909 on 22 June generated an ash plume that rose 2.6 km above the crater rim and drifted E. Tephra was ejected 1.1 km away, and shock waves were felt in the Miyazaki region. Minor amounts of ash fell in Kirishima prefecture and Kagoshima prefecture to the S, Miyakonojo city (Miyazaki prefecture) to the E, and Takahara Town. The Alert Level remained at 3 (on a scale of 1-5). The Tokyo VAAC reported that on 15 May ash plumes from Shinmoedake (Shinmoe peak), a stratovolcano of the Kirishimayama volcano group, were identified in satellite images drifting S at an altitude of 7.6 km (25,000 ft) a.s.l. JMA noted that white plumes rose 100 m above the crater rim during 18-21 May. The Alert Level remained at 3 (on a scale of 1-5). JMA reported that at Shinmoedake (Shinmoe peak), a stratovolcano of the Kirishimayama volcano group, an eruption occurred between 1444 and 1610 on 14 May. The plume rose to 4.5 km (15,000 ft) above the crater and drifted SE. A pyroclastic flow travelled 2 km down the flank. Volcanic earthquake rates under the crater increased after the eruption. Shallow, low-frequency earthquakes and tremor were also reported. The Alert Level remained at 3 (on a scale of 1-5). JMA reported that a very small explosion at Iwo-yama (also called Ioyama, NW flank of Karakuni-dake), a stratovolcano of the Kirishimayama volcano group, occurred at 1815 on 26 April and produced a milky white plume that rose over 200 m. The event continued until around 1826. 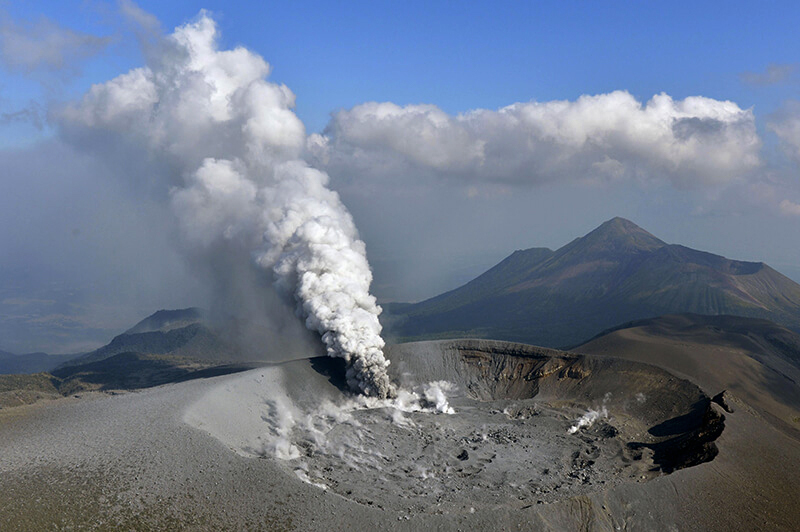 The event occurred from a fumarole in the vicinity of the highway, on the W side of Iwo-yama, first observed on 20 April. During a field survey on 30 April observers noted muddy water flowing as far as 500 m W. The Alert Level remained at 3 (on a scale of 1-5). 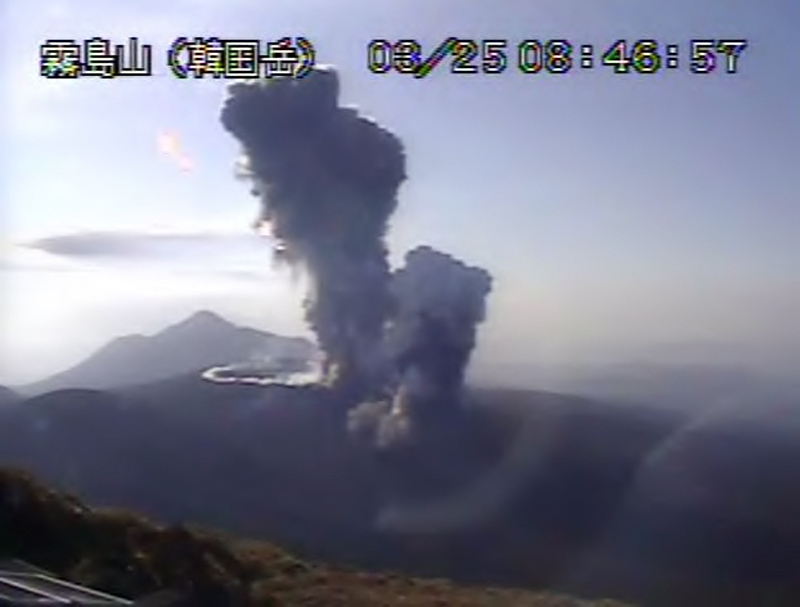 JMA reported that an explosive eruption at Shinmoedake (Shinmoe peak), a stratovolcano of the Kirishimayama volcano group, occurred at 0531 on 5 April and generated an ash plume that rose 8 km above the crater rim. According to news articles lightning was detected in the ash plume. JMA noted that incandescent tephra was ejected 1.1 km from the vent, and a pyroclastic flow traveled 800 m down the SE flank. Sulfur dioxide emissions increased to 1,400 tons/day, from 300 tons/day last measured on 28 March. The eruption possibly ceased at 0715. During an overflight later that day scientists confirmed a large amount of ashfall in parts of Kobayashi City and other areas of the Miyazaki Prefecture, in part of Takahara Town, and in areas of the Kumamoto prefecture. White plumes rose 200 m during 6-9 April. The Alert Level remained at 3 (on a scale of 1-5). Based on observations during overflights on 28 March and 2 April, JMA reported that the crack on the W flank of Shinmoedake (Shinmoe peak), a stratovolcano of the Kirishimayama volcano group, continued to widen. White emissions rose as high as 500 m above the crater rim. Several high-temperature regions around the margins of the lava in the crater, and from the flow on the NW flank, were detected on 28 March. The lava flow on the NW flank advanced 85 m from 9-29 March. Sulfur dioxide emissions were 300 tons/day on 30 March. The number of volcanic earthquakes began to decline after 26 March; though from 0014 to 1430 on 3 April the number increased to 239. Many low-frequency earthquakes with shallow hypocenters continued to be recorded. The Alert Level remained at 3 (on a scale of 1-5). JMA reported that the eruption at Shinmoedake (Shinmoe peak), a stratovolcano of the Kirishimayama volcano group, continued during 19-27 March. Lava effusion possibly stopped on 9 March, though the lava flow on the NW flank continued to advance. A high number of volcanic earthquakes continued to be recorded, in addition to many low-frequency earthquakes with shallow hypocenters. Short-duration volcanic tremor was occasionally recorded. During a field survey on 22 March scientists measured 600 tons/day of sulfur dioxide gas, and noted that the crack on the W flank had grown slightly larger. On 25 March an explosion at 0735 was followed by an ash plume that rose 3.2 km above the crater rim and ejected material as far as 800 m. An event at 0845 generated an ash plume that rose 2.1 km above the crater rim, and a very small pyroclastic flow that traveled 800 m W. Sulfur dioxide emissions were 300 tons/day on 24 March. The Alert Level remained at 3 (on a scale of 1-5). JMA reported that volcanic earthquakes at Shinmoedake (Shinmoe peak), a stratovolcano of the Kirishimayama volcano group, increased during 24-25 February. Volcanic tremor began to be recorded at 0815 on 1 March and intensified within a few hours. Residents in Takahara-machi, 12 km E (Miyazaki prefecture), reported ashfall at 1100; poor weather conditions prevented visual observations of the volcano. Later that day a small eruption was confirmed. Ashfall was reported in the Takahara-cho neighborhood, 12 km E (Miyazaki prefecture), around 1615. The eruption was observed at 1707 during an overflight. The sulfur dioxide flux was 5,500 tons/day, but then decreased to 2,200 tons/day on 2 March. During 2-3 March gray ash plumes rose as high as 1 km above the crater, and ash fell in Takahara-cho on 3 March. Ash plumes rose 400 m on 4 March. Explosive events on 6 March generated ash plumes that rose 2.3 km. During an overflight observers noted new lava on the E side of the crater, and plumes rising from both the center of the crater and an area on the N side. Ashfall was confirmed over a wide area from Kirishima prefecture and Kagoshima prefecture to the S, to Miyakonojo city (Miyazaki prefecture) to the E. A high number of volcanic earthquakes continued to be recorded. The Alert Level remained at 3 (on a scale of 1-5). JMA reported that during 13-20 November activity at Shinmoedake (Shinmoe peak), a stratovolcano of the Kirishimayama volcano group, continued to be slightly elevated. White plumes rose 200 m above the crater rim. The Alert Level remained at 3 (on a scale of 1-5). JMA reported that an eruption at Shinmoedake (Shinmoe peak), a stratovolcano of the Kirishimayama volcano group, began at 0534 on 11 October, prompting the agency to raise the Alert Level to 3 (on a scale of 1-5). Ash plumes rose 300 m above the crater rim (2 km a.s.l.) and drifted NE, though some news sources stated that plumes rose 2 km above the crater rim. Volcanic-tremor amplitude increased and inflation was detected. Ashfall was noted in at least four towns in the Miyazaki and Kagoshima prefectures. On 12 October ash plumes rose as high as 2 km. Based on JMA notices, pilot observations, and satellite data, the Tokyo VAAC reported that ash plumes rose 1.8-2.1 (6,000-7,000 ft) a.s.l. on 11 October and 3.4 km (11,000 ft) a.s.l. on 12 October. Gas measurements taken during field surveys on 12 and 13 October showed that the sulfur dioxide flux was 1,400 tons/day, an increase from 800 tons/day measured on 11 October. Volcanic tremor fluctuated but the amplitude was slightly lower. During 0823-1420 on 14 October an event produced a tall plume which rose 2.3 km above the crater rim. Another event, at 1505, generated a grayish-white plume that rose 1 km and then blended into the weather clouds. Ashfall was reported in Kirishima and Sono in the Kagoshima prefecture, and from Kobayashi in the Miyazaki prefecture to Hyuga city. An event was detected at 1300 on 15 October, and an increase in low-frequency earthquakes was recorded on 16 October. On 22 October the JMA reported that no eruptions had been detected at Shinmoe-dake (Shinmoe peak), a stratovolcano of the Kirishima volcano group, since the eruption on 7 September 2011. Earthquake activity and sulfur dioxide emissions were both below the detection limit. The Alert Level was lowered to 2 (on a scale of 1-5). Based on notifications from JMA, the Tokyo VAAC reported that during 31 August-6 September ash plumes from Kirishima's Shinmoe-dake (Shinmoe peak) rose to altitudes of 1.5-2.1 km (5,000-7,000 ft) a.s.l. and drifted N, S, and SW.
Based on notifications from JMA, the Tokyo VAAC reported an eruption from Kirishima on 6 August. Based on notifications from JMA, the Tokyo VAAC reported that on 29 June an eruption from Kirishima's Shinmoe-dake (Shinmoe peak) produced a plume that rose to altitudes of 1.8-2.4 km (6,000-8,000 ft) a.s.l. and drifted N.
Based on notifications from JMA, the Tokyo VAAC reported that on 23 June an eruption from Kirishima's Shinmoe-dake (Shinmoe peak) produced a plume that rose to an altitude of 1.8 km (6,000 ft) a.s.l. and drifted E.
Based on notifications from JMA, the Tokyo VAAC reported that on 18 April an ash plume from Kirishima's Shinmoe-dake (Shinmoe peak) rose to an altitude of 3.7 km (12,000 ft) a.s.l. and drifted SE. Based on notifications from JMA and pilot observations, the Tokyo VAAC reported that during 3-4 April ash plumes from Kirishima's Shinmoe-dake (Shinmoe peak) rose to altitudes of 4.6-6.1 km (15,000-20,000 ft) a.s.l. and drifted E.
Based on notifications from JMA, the Tokyo VAAC reported that an eruption from Kirishima's Shinmoe-dake (Shinmoe peak) on 23 March produced a plume that rose to an altitude of 2.4 km (8,000 ft) a.s.l. and drifted SE. Subsequent notices that day stated that the ash had dissipated. An eruption on 29 March produced a plume that rose to an altitude of 2.1 km (7,000 ft) a.s.l. and drifted SE. Based on notifications from JMA and pilot observations, the Tokyo VAAC reported that an eruption from Kirishima's Shinmoe-dake (Shinmoe peak) on 13 March produced ash plumes that rose to altitudes of 5.5-6.1 km (18,000-20,000 ft) a.s.l. Some plumes drifted E. According to news sources, people within 1.6 km evacuated and windows more than 6 km away shattered. The Tokyo VAAC reported that an ash plume from Kirishima's Shinmoe-dake (Shinmoe peak) observed by a pilot on 3 March rose to an altitude of 3.7 km (12,000 ft) a.s.l. and drifted NE. Based on reports from JMA, the Tokyo VAAC reported that plumes rose to altitudes of 1.5-3 km (5,000-10,000 ft) a.s.l. and drifted SE during 3-4 and 8 March. Based on reports from JMA, the Tokyo VAAC reported that eruptions from Kirishima's Shinmoe-dake (Shinmoe peak) on 24 and 28 February as well as 1 March produced plumes that rose to altitudes of 1.8-2.1 km (6,000-7,000 ft) a.s.l. and drifted N, E, and SE. Based on reports from JMA, the Tokyo VAAC reported that on 18 February an explosion from Shinmoe-dake (Shinmoe peak), a stratovolcano of the Kirishima volcano group, produced a plume that rose to an altitude of 4.6 km (15,000 ft) a.s.l. and drifted S. A pilot reported that an ash plume rose to an altitude of 5.5 km (18,000 ft) a.s.l. and drifted E. The next day, satellite imagery showed that the ash had dissipated. According to a news article on 17 February, officials recommended that more than 2,500 residents should evacuate their homes due to potential lahar activity from heavy rain. An official noted that 63 people in Miyakonojo (30 km SE) had already moved to evacuation shelters. Based on reports from JMA, the Tokyo VAAC reported that during 9-11 February explosions from Shinmoe-dake (Shinmoe peak), a stratovolcano of the Kirishima volcano group, produced plumes that rose to altitudes of 1.8-4 km (6,000-13,000 ft) a.s.l. and drifted E and SE. On 11 and 14 February, pilots observed ash plumes that rose to altitudes of 4.6-6.1 km (15,000-20,000 ft) a.s.l. 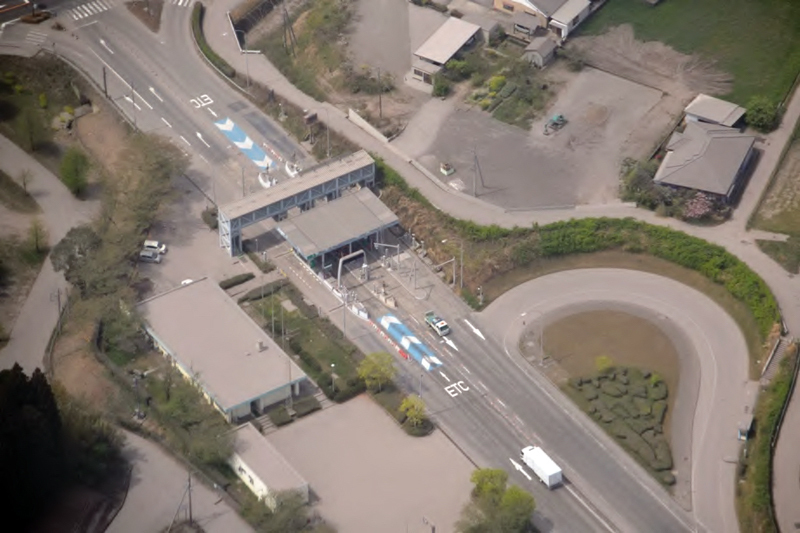 According to a news article, rocks ejected during an eruption on 14 February broke windows in cars parked at the Kirishima service area on the Miyazaki expressway and in several places in Kobayashi, 13 km NE. According to the Earthquake Research Institute, an explosion on 26 January from Shinmoe-dake (Shinmoe peak), a stratovolcano of the Kirishima volcano group, prompted JMA to raise the Alert Level to 3 (on a scale of 1-5). Lightning in the ash plume was visible in video footage that same day. Based on reports from JMA, analyses of satellite imagery, and pilot observations, the Tokyo VAAC reported that during 26-27 January ash plumes rose to altitudes of 1.8-2.1 km (6,000-7,000 ft) a.s.l. and drifted SE. According to news articles, tephra fell as far away as 8 km on 27 January and disrupted airline and train services. Some people in Miyazaki (55 km E) voluntarily evacuated and approximately 30 people in Takaharu (15 km E) spent the night in an evacuation center. Video footage showed people clearing ash from the streets. During an overflight on 29 January, scientists observed a new lava dome in the crater, about 50 m in diameter and incandescent in some areas. They also observed that the crater lake was gone and pyroclastic-flow deposits, 500-600 m long, were present in the SW crater. Notices issued from the Tokyo VAAC during 28-30 January stated that ash emissions were continuing. On 31 January, an ash plume rose to an altitude of 2.1 km (7,000 ft) a.s.l. and drifted SE. A news article noted that an explosion on 1 February was heard more than 7 km away, and broke glass in buildings and cars as far as 8 km away. According to JMA, an eruption from Shinmoe-dake (Shinmoe peak), a stratovolcano of the Kirishima volcano group, on 19 January produced a shock wave that was detected 12 km NE and an ash plume that drifted SE. Ashfall up to 5 mm thick was reported in Miyakonojo (30 km SE); ashfall was also reported as far as Nichinan City (60 km SE). An eruption on 22 January ejected material 200 m above the vent. Based on reports from JMA and pilot observations, the Tokyo VAAC reported that ash plumes rose to altitudes of 1.8-2.1 km (6,000-7,000 ft) a.s.l. and drifted SE. Based on reports from JMA, the Tokyo VAAC reported that an eruption from the Kirishima volcanic complex on 10 July produced a plume that rose to an altitude of 1.8 km (6,000 ft) a.s.l. Based on reports from JMA, the Tokyo VAAC reported a possible eruption of Kirishima on 28 June. Information about a possible resulting plume was not reported. According to JMA, a small eruption from Shinmoe-dake (Shinmoe peak), a stratovolcano of the Kirishima volcano group, on 27 May produced an ash plume that rose 100 m above the crater rim. Ashfall was noted in areas within 6 km. Emissions gradually decreased. An eruption from Shinmoe-dake (Shinmoe peak), a stratovolcano of the Kirishima volcano group, on 30 March prompted JMA to raise the Alert Level from 1 to 2 (on a scale of 1-5). Ash blanketed the ground to the W of the crater. Based on reports from JMA, the Tokyo VAAC reported a possible eruption of Kirishima on 22 August. The altitude and direction of a possible resultant plume were not reported. Seismicity increased from "normal" levels at Kirishima on 13 December, and the same day Dr. Kobayashi of Kagoshima University found new fumarole pits at the volcano's Ohachi Crater. A video camera at the volcano showed steam rising above the crater rim. Observers saw two new pits that formed in the middle of the crater's southern inner wall and steam rising to ~100 m. Also, pebbles (that were 2-3 cm across) and mud were scattered within about 10 m of these pits. JMA issued a volcanic advisory on 16 December, as the possibility of a small eruption had increased, judging from the high level of seismic and thermal activity. On 17 December authorities announced that tourists were not permitted to visit Ohachi Crater. The level of seismicity peaked in mid December, then declined somewhat, continuing at a relatively high level through at least mid January. An earthquake swarm in the vicinity of Kirishima, including some felt events, was recorded on 7 July. No surface activity was observed. Kirishima's last eruption, on 5 August 1971, ejected accessory tephra and mud. No seismicity was recorded preceding the 1971 eruption. Further Reference. Ida, Y., Yamaguchi, M, and Masutani, F., 1986, Recent seismicity and stress field in Kirishima volcano: Journal of the Seismological Society of Japan, v. 39, p. 111-121. Information Contacts: Japan Meteorological Agency (JMA); D. Shackelford, CA. JMA personnel visited the summit crater of Shinmoe-dake, one of the SE group of volcanic edifices in the Kirishima complex, on 23 April. 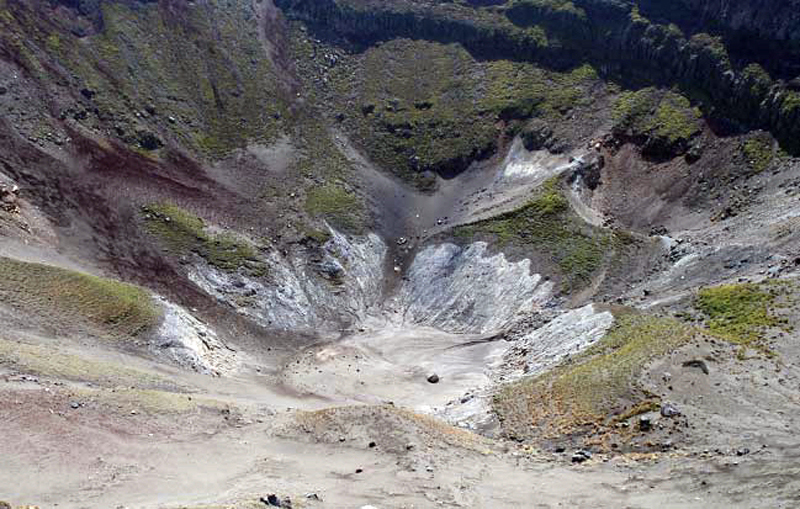 They found a 10-cm-wide sulfur flow that had traveled more than 50 m downslope from one of the summit crater fumaroles, which also was surrounded by scattered, explosively ejected sulfur. The sulfur, molten when it was ejected during the winter, was a dark brown solid in April. Fumarolic activity had increased since November 1980 in the Iodani ("Sulfur Valley") area at the W base of the volcano. Personnel from Kagoshima and Tokyo Universities, Tokyo Industrial College, and the JMA observatory monitored the temperatures and the chemical composition of the vapor. The highest temperature measured was 98°C in March, the same as during the past 2 years. The gas content varied from 90% CO2-10% H2S to 70% CO2-30% H2S. New fumaroles appeared in a residential area. Because of the dense gas, civil police closed a parking area and part of a road. On 8 January JMA personnel discovered a 6-m-long, 30-cm-wide, 2-cm-thick sulfur flow that had emerged from Fumarole No. 6 in Shinmoe-dake (figure 1), a crater in the summit area of the Kirishima volcanic complex. Pieces of sulfur and tar-like material were scattered around the fumarole. Figure 1. Cross-section and map of Shinmoe-dake crater at Kirishima. Numbers identify individual fumaroles. Courtesy of JMA. Increased geothermal activity was observed on the inner wall of Shinmoedake in December. The measured temperature of Fumarole No. 6 was 184°C, the highest since JMA's Kagoshima Observatory began summit area temperature measurements in 1979. Vegetation on the N inner wall had been damaged by the increased activity. Fumarolic activity in the Iodani area, about 5 km WSW of Shinmoedake, had increased from November 1980 through 1981. On 8 January JMA observers found that this activity had declined to its usual level. The last major activity at Shinmoedake was a steam explosion in 1959, when tephra was ejected, mainly from the fissure trending W from the crater. A swarm of microearthquakes began at around 2300 on 13 November beneath Shinmoe-dake cone. The number of earthquakes increased sharply the next day, and seismicity remained elevated until the morning of 26 November, with the exception of two brief quiet periods on 19-20 and 23-24 November (figure 2). Seismicity reached the highest level since the start of monitoring in 1965 (figure 3), while episodic and continuous volcanic tremor were recorded for the first time. Five volcanic tremor episodes were recorded 13-23 November, ranging from 0.2 to 2.5 µm in amplitude and 1-7 minutes in duration. Continuous weak volcanic tremor (0.1 µm amplitude) began at 0305 on 26 November. Figure 2. Daily number of earthquakes at Kirishima, 1 March-15 December 1991. Courtesy of JMA. Figure 3. Monthly number of earthquakes at Kirishima, January 1970-November 1991. Courtesy of JMA. Steam emission was first reported by tourists on 24 November, and confirmed during an overflight the following day. The plume rose 200-500 m from fumaroles on the E inner wall of the main crater; previous steam emission, last observed in 1990, had usually reached only a few meters high. Tremor and steam emissions continued as of 16 December. Seismicity remained at low levels through mid-January, but weak tremor continued to be recorded by a seismometer 1.7 km SW of the summit crater. Steam began to emerge from the crater on 24 November, and steady steam emission to 100-200 m height was continuing in mid-January. Steam emission . . . continued in January reaching 200-400 m height. Fieldwork 28-29 January revealed a trace of ash covering half of the crater floor, but no associated changes in seismicity were recorded. The monthly number of earthquakes declined to 38 in January, from 86 in December. Weak tremor was recorded continuously by seismometers near the cone, from late November through early February. Steam emission . . . continued steadily in February, reaching 200-300 m height. The ground around the fumaroles was covered by a fine dusting of ash during air reconnaissance on 5, 12, and 18 February. Seismicity was low, with continuous volcanic tremor ceasing on 2 February, and a monthly total of 25 recorded earthquakes . . . . Steam emission from Shinmoe-dake cone's summit crater . . . produced a continuous 100-200-m-high plume in March. Seismicity was at low levels, with a monthly total of 27 small earthquakes, similar to February . . . . Two weak tremor episodes were recorded on 6 and 17 March. Fine ash emissions . . . were not observed in March. Steam emission continued steadily in April to 100-200 m height. A light dusting of ash was noted on leaves in the crater during a 6 April visit. The maximum measured fumarole temperature was 96°C. Seismicity was at low levels in April, but a weak tremor episode was recorded on the 11th. A monthly total of 23 small earthquakes was recorded, almost unchanged from March. Similar activity continued through early May. During 25-30 August there was an increase in seismicity near Shinmoe-dake; 126 earthquakes on the 26th were recorded 1.7 km SW. The maximum seismic amplitude of 3.2 µm occurred on the 30th. In total, 463 events were recorded in August. The total number of earthquakes in September was 182, a significant decreased compared to the 463 recorded in August. On 29 September there were 25 earthquakes recorded at Station A, 1.7 km SW of Shinmoe-dake Crater, the highest daily total of the month. A Volcanic Advisory on Kirishima volcano (figure 4) was issued on 10 November 1999 by the Japan Meteorological Agency (JMA) after seismicity began increasing on 6 November. This is the first advisory at Kirishima since 27 August 1995 (BGVN 20:08 and 20:09). Earthquakes detected at a site 1.7 km SW of Shinmoe-dake totaled 666 during 6-15 November (table 1), peaking at 192 events on the 10th. No volcanic tremor was observed. Figure 4. Steam from Shinmoe-dake at Kirishima looking towards the SE in 1991. Naka-dake is the adjacent cone with a flat top, and in the background is Ohachi (crater to the right), Takachiho-no-mine (the highest peak in the center), and Futatsuishi (left). Courtesy of T. Kagiyama, ERI. Table 1. Daily numbers of volcanic earthquake events at Kirishima, 5-15 November 1999. Courtesy of JMA. Information Contacts: JMA-Fukuoka, Japan Meteorological Agency (JMA), 1-3-4 Ote-machi, Chiyoda-ku, Tokyo 100, Japan; Setsuya Nakada and Tsuneomi Kagiyama, Volcano Research Center, Earthquake Research Institute, University of Tokyo, Yayoi 1-1-1, Bunkyo-ku, Tokyo 113, Japan (URL: http://www.eri.u-tokyo.ac.jp/VRC/index_E.html). In 1991 there was a seismic increase at Kirishima (BGVN 25:02), a group of more than 20 Quaternary volcanoes occupying 600 km2 in an area N of Kyushu island's Kagoshima Bay (figures 5 and 6). The previous eruption of Kirishima took place from 1 December 1991 to 19 April 1992, when Shinmoe-dake intermittently ejected ash (BGVN 16:11-17:04; Imura, 1992). Figure 5. Wide-angle view of Shinmoe-dake crater at Kirishima looking NW. Prominent are both the crater wall and the aqua-blue lake. The flat-topped cone in the background is Karakuni-dake (summit elevation 1,700 m) the tallest peak in the Kirishima complex. The rubbly material draping the the lower half of the crater wall represents remnants of a lava lake formed during the 1716-17 eruption. Copyrighted photo by Keizo Morita (used with permission). Figure 6. Maps of the South Kyushu region showing recently active volcanoes. The Kirishima volcanic group ("Kirishimayama") lies near the map's N edge. Taken from Matsumoto and others (2007). This report notes that seismic and thermal unrest also occurred in 2003-2004. Four years later (in August 2008) Kirishma had a sudden, short-lived eruption. Although the plume seemingly did not rise above 1 km altitude, observers chronicled a thin airfall ash deposit highly elongate to the NE. Late 2003 and early 2004 unrest. 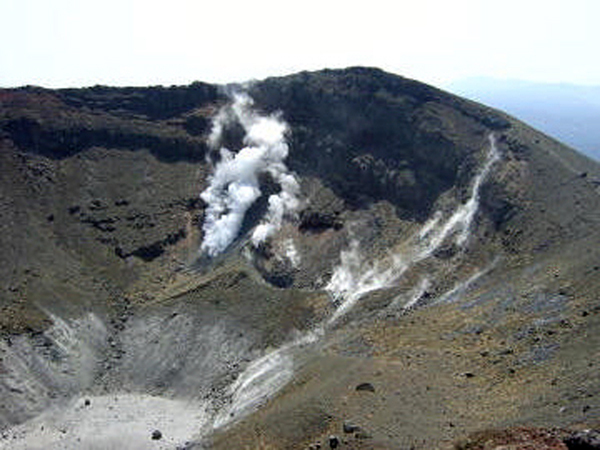 Seismicity increased from "normal" levels on 13 December 2003, and the same day observers saw new fumarole pits at the Ohachi crater. A video camera showed steam rising above that crater's rim. Observers saw two new pits that formed in the middle of that crater's southern inner wall and steam rising to ~ 100 m. Within ~ 10 m of these pits, observers saw freshly ejected mud and cognate pebbles 2-3 cm across. The seismicity peaked in mid-December, then declined somewhat, continuing at a relatively high level through at least mid-January 2004. Multi-year seismic overview. Seismicity rose substantially starting on 19 August 2008 (figure 7), several days prior to the 22 August eruption. Japan Meteorological Agency (JMA) reported 1,005 earthquakes during August 2008. In contrast, the monthly number of earthquakes recorded during the previous 13 months ranged between 2 and 118, with only four earthquakes seen during each of the two months prior to the eruption. Figure 7. Earthquakes and tremor duration measured at station A (1.7 km SW of the Shimoe-dake's summit) during 2003 to end of August 2008. The top two panels show daily earthquakes. The third panel down shows tremor, with circle size scaled to duration. The lowermost panel shows plume height, which was absent until the 22 August 2008 eruption. Taken from JMA (2008). Tremor was rare during 2003-2008. There had been tremor during early 2006, and briefly in 2007, but the 2008 tremor included three episodes. During 2008 the longest tremor episode, in August, continued for 350 minutes (the full circle goes off the scale of the plot). Eruption on 22 August 2008. The eruption began at 1634 on 22 August 2008 from Shinmoe-dake, a stratovolcano with a summit rim around 1,400 m elevation and a main 750-m-diameter crater containing a lake (figure 8). 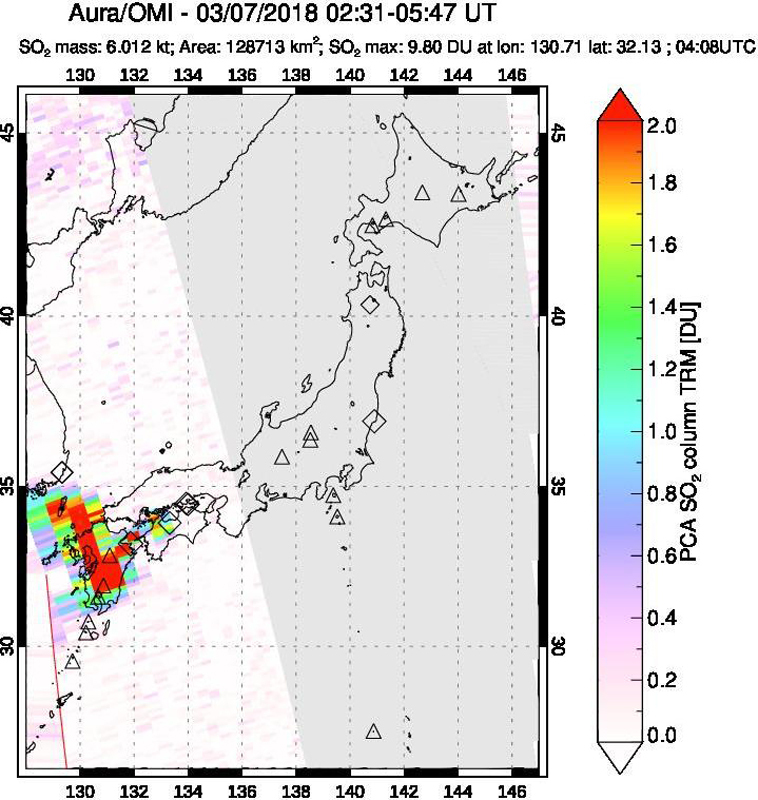 JMA noted that the tallest plume only reached ~ 850 m altitude. Post-eruption inspection found that fissures at Shinmoe-dake had recently opened both in the crater and on its W flank (figures 8 and 9). Also, observers found abundant ballistic lithics near the fissures. Figure 8. Diagram showing key surface features found at Kirishima's Shinmoe-dake associated with the 22 August 2008 eruption. Also labeled is the upper margin of a lava lake that formed in the crater during the 1716-1717 eruption. Adapted from the August 2008 monthly report by Japan Meteorological Agency (JMA, 2008). Figure 9. Aerial photo of the W flank of Shinmoe-dake at Kirishima showing fissures as seen on 24 August 2008. Some of these features were present prior to the eruption. An enlarged view shows numerous light colored ballistic blocks thrown out by the 2008 eruption. Some are apparently over a meter in diameter. Photo taken from JMA (2008). Ash fell at Kobayashi City (10 km NE) and reached up to 25 km from the source (figure 10). According to Nobuo Geshi (Geological Survey of Japan), ~ 200,000 metric tons of ash was erupted. Under the microscope, the ash was composed mostly of non-juvenile materials, although some juvenile glass fragments were found (University of Tokyo - Earthquake Research Institute and Kagoshima University, 2008). As of early November 2008, authorities had not issued further reports, implying quiet conditions. 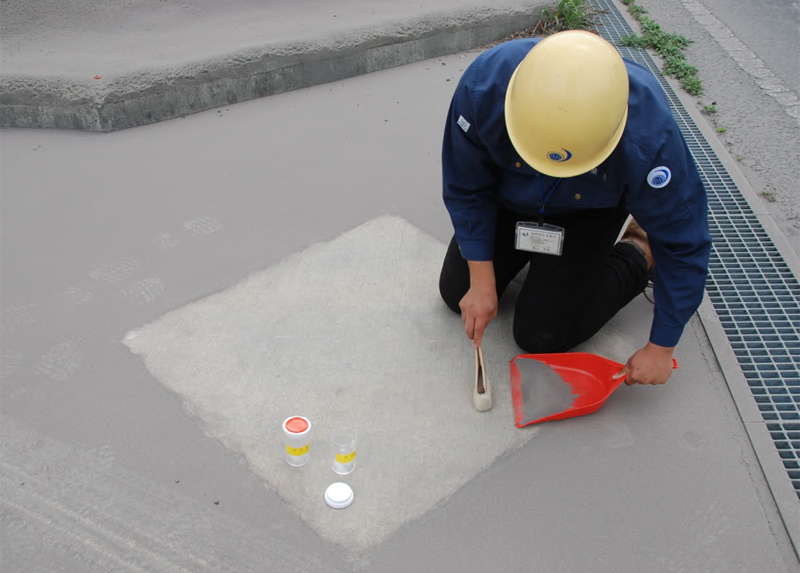 Because of low seismicity and lack of ash plumes, JMA lowered the Alert Level from 2 to 1 on 29 October 2008. Figure 10. Preliminary near-source isopach map describing ash fall from Kirishima's 22 August 2008 eruption. The map extends out to ~ 10 km from the vent (horizontal scale, bottom right) although ash also fell much farther away. On the key and enlarged views of this map one can see the sites where ash thickness data were collected, providing insight into the map's construction. Some of these points indicate the absence of detectible ash, and at two sites, density data. Field work supporting the map was conducted during 1-2 September 2008. Map was created by Nobuo Geshi (Geological Survey of Japan; original in Japanese). Partial list of resources discussing Shinmoe-dake. Two informative reports in Japanese helped describe the eruption. The first was the report by JMA (2008), from which figures 7-9 were extracted. That report discussed pre- and post-eruption monitoring, including geophysics, geodetics, behavior of fumaroles, the development of new fissures and fumaroles (including photos and thermal anamalies). The second report, University of Tokyo - Earthquake Research Institute and Kagoshima University (2008), discussed erupted ash. Fukui and others (2008) discussed Shinmoe-dake's deformation. Their studies employed deformation monitoring by Global Positioning System (GPS) during 2001-2007. Their data disclosed uplift starting in mid-2004. A website mentioned Kirishima in regard to engineering approaches (sabo dams and related structures) to manage rivers and basins confronting mass wasting at volcanoes (Sakurajima International Sabo Center, 2008). The same site also shows a monitoring camera for Shimnoe-dake and posts a disaster prevention map for Kirishima (in Japanese). 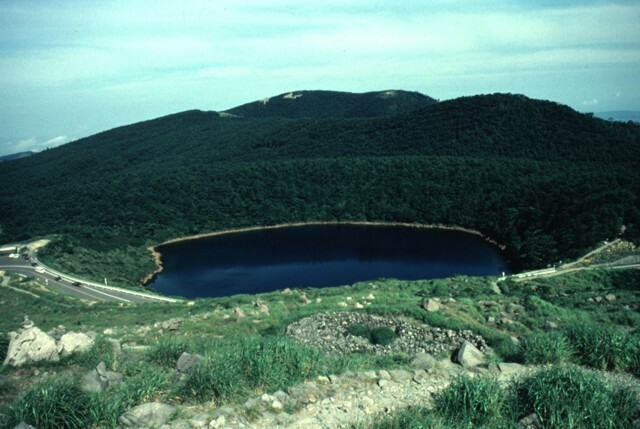 In 1992, geophysicists completed a self-potential survey at Shinmoe-dake (Hashimoto and others, 1994) finding a negative anomaly over the crater basin, a result interpreted as due to streaming potential due to the crater lake and the motion of ions through porous rock. Positive anomalies were small and local and corresponded to fumaroles. Continuous self-potential monitoring during December 1991 to 1993 indicated few changes. References. Fukui, K., Torisu, K., Tomoyuki, K., Sakai, T., and Takagi, A., 2008, Volcano deformation detected by GPS observation around Shinmoe-dake crater of Kirishima and pressure source estimation by FEM: Meeting Proceedings of the Japan Geoscience Union, Makuhari, Japan, 26 May 2008, v. 151, p. 20. Imura, R., 1992, Minor phreatic activity of Shinmoedake, Kirishima volcano, in 1991-92: Bull Volc Soc Japan (Kazan), v. 37, p. 281-283 (in Japanese). Hashimoto, T., Kagiyama, T., and Masutani, F., Self-potential measurements on Shinmoe-Dake, Kirishima Volcanic Group: Bull. Earthq. Res. Inst. Univ. of Tokyo, v. 69, p. 257-266. Japan Meteorological Agency, 2008, August 2008 Monthly Report on Kirishima: Japan Meteorological Agency (URL: http://www.seisvol.kishou.go.jp/tokyo/STOCK/monthly_v-act_doc/fukuoka/08m08/505_08m08.pdf). Matsumoto, T., Ueno, H., and Kobayashi, T., 2007, A new secular variation curve for South Kyushu, Japan, and its application to the dating of some lava flows: Rep. Fac. Sci., Kagoshima Univ., no. 40, p. 35-49. University of Tokyo - Earthquake Research Institute and Kagoshima University, 2008, About ejecta of eruption of 22 August 2008 from Shinmoe-dake (Kirishima): University of Tokyo (Earthquake Research Institute) and Kagoshima University (in Japanese; published 30 August 2008) (URL: www.eri.u-tokyo.ac.jp/topics/Kirishima2008/Figure/kazanbai080830.pdf). Sakurajima International Sabo Center, 2008, Volcanic Sabo in Japan: Sakurajima International Sabo Center (URL: http://www.qsr.mlit.go.jp/osumi/sivsc/home/english/j038.html). Information Contacts: Volcanological Division, Seismological and Volcanological Department, Japan Meteorological Agency (JMA), 1-3-4 Ote-machi, Chiyoda-ku, Tokyo 100 Japan; Nobuo Geshi, Geological Survey of Japan (GSJ), AIST, (Volcanic activity research group), Building No. 7, 1-1-1 Higashi, Tsukuba, Ibaraki, 305-8567 Japan; Volcano Research Center (VRC-ERI), Earthquake Research Institute, University of Tokyo , Yayoi 1-1-1, Bunkyo-ku, Tokyo 113, Japan (URL: http://www.eri.u-tokyo.ac.jp/VRC/index_E.html); Keizo Morita (URL: http://www.pmiyazaki.com/kirishima/tz/sinmoe/pano01.htm). Setsuya Nakada (Volcano Research Center, University of Tokyo) reported that Subplinian and Vulcanian explosions occurred in the Kirishima Volcano Group in mid-January and at least as late as early February 2011. The event followed a year of inflation. The eruption occurred at Shinmoe-dake (Shinmoedake) volcano and included both airfall ash as well as the the birth and rapid growth of a lava dome. Small pyroclastic flows occurred, and over 1,000 residents evacuated. After its 22 August 2008 eruption (BGVN 33:09), Shinmoe-dake went on to generate small phreatic explosions. These explosions took place on 15 November 2009 and 30 March, 11 April, and 27 May 2010. Inflation preceded the 2011 eruption. the Geographical Survey Institute of Japan evaluated global positioning system (GPS) data for one year before the 2011 eruption. They found sufficient inflation to indicate the injection of 20 x 106 m3 of material. According to the Japan Meteorological Agency (JMA), the eruption began, with a phreatomagmatic explosion from Shinmoe-dake on 19 January 2011. It produced a shock wave detected 12 km NE of the volcano, and an ash plume drifted SE. Ashfall up to 5 mm thick was reported in Miyakonojo (30 km SE) and in Nichinan City (60 km SE). Nakada reported that products of that explosion contained ~10% juvenile pumice. Another explosion on 22 January 2011 ejected material 200 m above the vent. Based on reports from JMA and pilot observations, the Tokyo Volcanic Ash Advisory Center (VAAC) reported that ash plumes rose to altitudes of 1.8-2.1 km and drifted SE. A third explosion began at 0731 on 26 January, and Subplinian explosions occurred at 1850 on 26 January, at 1541 on 27 January, and at 1247 on 28 January. Volcanic ash was emitted continuously until 30 January, when lava covered the crater floor. The heights of the three major explosions during 26-28 January, confirmed with Doppler radar by JMA, were up to 8.5 km above the crater. Ashfall deposits were found ~17 cm thick at a distance of ~3 km SW of the crater, and ~8 cm thick at a distance of ~6 km from the crater. Figures 11 and 12 are photos taken on 27 January amid the three major explosions of 26-28 January. Figure 11. Eruption column generated by an explosion at 1541 on 27 January 2011 at Kirishima's Shinmoedake crater. Taken ~3 km SW of the crater by Setsuya Nakada. Figure 12. Continuously emitted Subplinean eruption cloud from Kirishima's Shinmoedake crater seen in the late afternoon of 27 January 2011. Taken from 3 km WSW of the crater by S. Nakada. According to the Earthquake Research Institute (ERI), the explosion on 26 January 2011 prompted JMA to raise the Alert Level to 3 (on a scale of 1-5). Lightning in the ash plume was visible in video footage that same day. Based on reports from JMA, analyses of satellite imagery, and pilot observations, the Tokyo VAAC reported that on 27 January ash plumes rose to altitudes of 1.8-2.1 km and drifted SE. According to news articles, tephra fell as far away as 8 km on 27 January and disrupted flights and train service. Some people in Miyazaki (55 km E from the volcano) voluntarily evacuated, and about 30 people in Takaharu (15 km E) spent the night in an evacuation center. On 28 January, a small lava dome 200 m in diameter appeared on the crater floor near the vent (figure 13). In three days, it grew to ~600 m in diameter and attained a volume of more than 107 m3. ALOS satellite images disclosed that the dome grew to the point where it completely covered the active vent. Figure 14 shows the concentrically ringed and steaming lava dome on the crater floor as it appeared on 30 January. Figure 13. Lava dome within Kirishima's Shinmoe-dake crater, which appeared in the center of the crater floor, near the crater that produced Subplinian explosions (to the right in this photo). Taken by S. Nakada on 28 January 2011. 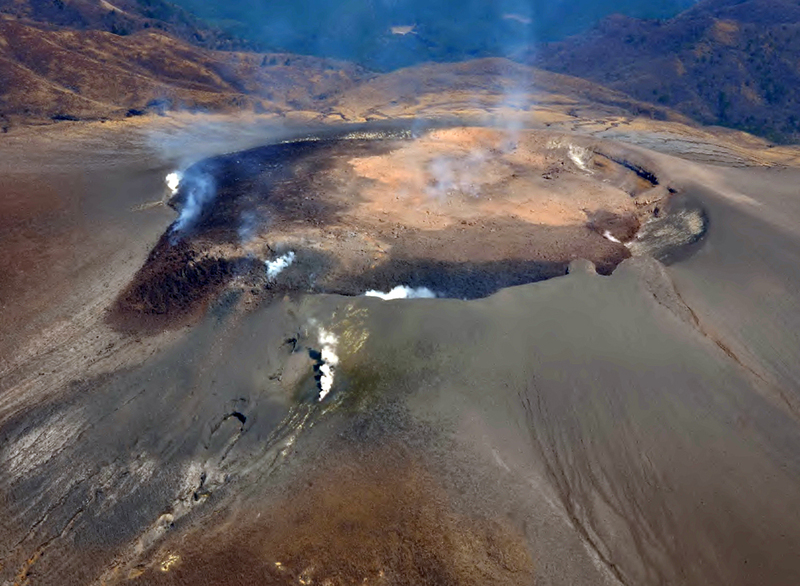 During an overflight on 29 January 2011, scientists from the ERI observed freshly erupted dome material on the crater floor and saw that the crater lake was gone. Fresh pyroclastic flow deposits in the SW crater had runout distances of 500-600 m.
On the night of 31 January, 1,158 people who lived in the Takaharu Town, ~12 km W of the crater and subject to potential pyroclastic flows, were ordered to evacuate due to a possibility of a Plinian explosion. As of 5 February, 73 people who lived less than 8 km from the crater were still in the process of evacuating. A Vulcanian explosion started on 1 February 2011, destroying part of the dome. Volcanic ash rose about 7 km above the crater, according to JMA. Large ballistics 0.7 m in diameter landed 3.2 km W of the crater. Authorities established a zone of limited access within 4 km the crater. During subsequent Vulcanian explosions, the dome stopped growing. Its morphology flattened, and it became covered with its own ejecta. Strong steam emanated from the dome's center on 4 February (figure 14). That day, Japan's Prime Minister delivered an address on the eruption at a meeting of government officials. They outlined responses and approaches to the crisis, including expanding the hazard zone, evacuation routes, countermeasures to lahars, and the danger of pyroclastic flows. Figure 14. Westerly view of the lava dome growing in Kirishima's Shinmoe-dake crater on 31 January 2011. Courtesy of Tetsuo Kobayashi (Kagoshima University). Pumice from this eruption was composed of pyroxene-bearing andesite (57 to 62% SiO2), showing mingling of two magmas with different colors. The progress of this eruption seemed similar, Nakada noted, to the early stage of the volcano's 1716-1717 eruption. That eruption included a 3-month explosive phase, including five events with pyroclastic flows, for a total volume of erupted products amounting to 67 km3 DRE ('dense-rock equivalent,' the volume assuming no porosity, i.e., no bubbles). That eruption lasted for 1½ years (Imura and Kobayashi, 1991). The eruption was studied from many perspectives, including satellite, seismic, magnetometer, GPS, tiltmeter, and infrasonic. Significant illustrations of data relating to the eruption have emerged, describing spatial distribution of plumes and deposits, geophysical, geochemical, petrographic, and other information only briefly covered here (ERI, 2011). Outstanding still and video images of the eruption appeared widely in the news and on the internet. No fatalities were cited in news reports accessed at press time in late February 2011. References. ERI, 2011, Eruption of Shinmoe-dake (Kirishima volcano group), Japan, 2011; Earthquake Research Institute (ERI), Univ. of Tokyo (URL: outreach.eri.u-tokyo.ac.jp/eqvolc/201101_shinmoe/eng/). Imura, R. and Kobayashi, T., 2001, Geological map of Kirishima Volcano (1:50,000), Geological Survey of Japan. Imura, R. and Kobayashi, T., 1991. Eruptions of Shinmoedake Volcano, Kirishima Volcano Group, in the last 300 years, Bulletin of Volcanological Society of Japan, v. 36, pp.135-148 (in Japanese with abstract in English). Information Contacts: Setsuya Nakada, Volcano Research Center, Earthquake Research Institute (VRC-ERI), University of Tokyo, Yayoi 1-1-1, Bunkyo-ku, Tokyo 113, Japan (URL: http://www.eri.u-tokyo.ac.jp/topics/ASAMA2004/index-e.html); Tetsuo Kobayashi, Graduate School of Science and Engineering, Kagoshima University, Kagoshima, Japan 890-006; Japan Meteorological Agency (JMA), Otemachi, 1-3-4, Chiyoda-ku Tokyo 100-8122, Japan (URL: http://www.jma.go.jp/); Tokyo Volcanic Ash Advisory Center (VAAC), Tokyo, Japan (URL: http://ds.data.jma.go.jp/svd/vaac/data/). Our last issue (BGVN 35:12) discussed the explosive eruptions and dome growth from early 2011 (19 January to about 4 February) from the summit crater of Kirishima's Shinmoe-dake. Vulcanian and Subplinian eruptions released enough ash to delay air traffic and prompt evacuations. Regular ash plumes were observed above the volcano by pilots and with satellite imagery from January 2011 through March 2011 (table 2). More than 140 advisories were issued by the Tokyo Volcanic Ash Advisory Center (VAAC) since the eruption began in January, although only 14 were issued between April and July. Relying primarily on JMA data, this report presents a review of the monthly highlights, followed by a section with tilt, geodetic, and multi-year seismic data. Table 2. Kirishima ash plumes reported from 22 January through 29 June 2011 based on JMA and VAAC reports with plume heights and drift directions. No plumes were reported for May or July. Peak of Kirishima's 2011 activity. The most dramatic events of the reporting interval took place on 1 and 14 February 2011. JMA field surveyors and local communities reported ballistics from Shinmoe-dake impacted areas up to 3.2 km SW from the crater; these volcanic bombs were from the 1 February eruption. Car windows, solar panels, and roofs were damaged from a shockwave and rock fragments that ranged from lapilli to bombs (up to 0.7 m) (figure 15). Figure 15. JMA investigated several sites within 5 km of Kirishima's Shinmoe-dake, where damage from volcanic bombs was reported. The location map shows political boundaries (gray and green) and investigation sites (red squares). At Site 1, investigators found ballistics larger than 0.3 m; at Site 2, ballistics larger than 0.4 m; at Site 3, broken car windows; and at Site 4, damaged roofs. A map showing the volcano's location off the Korean Peninsula and the main islands of Japan appeared in BGVN 33:09. Courtesy of JMA. The largest explosion, at 0754 on 1 February 2011, launched large blocks and juvenile material that impacted the forest to distances of 3.2 km from the crater. Kyushu University recorded oscillations from the impacts of some of these bombs. Investigators from the Earthquake Research Institute of the University of Tokyo visited an impact crater that was surrounded by broken trees; bomb fragments could be found more than 50 m from the crater. Charred wood was found beneath some of the bombs indicating that the material was still hot when it impacted the ground (personal communication, John Lyons, Michigan Technological University). On 14 February, roofs were damaged when volcanic bombs traveled up to 16 km NE; JMA reported that strong winds that day contributed to these long dispersal distances. According to local news reports, bombs struck and damaged cars parked in the service area of Miyazaki Expressway and they shattered windows in Kobayashi, 13 km NE. News reports relayed recommendations from civil authorities to evacuate 72,500 people from near Shinmoe-dake due to lahar hazards. Heavy rain had been falling since the previous day and in preparation for expected debris flows, authorities opened primary schools and community centers to shelter residents. 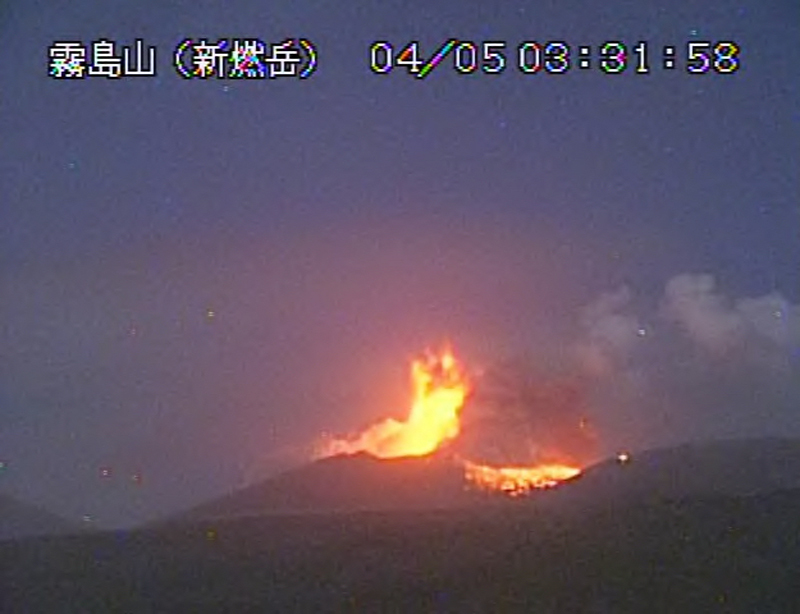 At the time of the advisory, 63 people has already evacuated from Miyakonojo, 30 km SE of the crater region. According to the JMA monthly report, incandescence was visible at night from 26 January to 10 February and also on 28 February. SO2 flux was 11,000-12,000 tons/day during January and averaged 600 tons/day on 25 February. There were 2,037 and 2,506 seismic events in January and February respectively. Tremor was continuous from 26 January to 7 February (a decrease occurred on 29 January). After 7 February, tremor was intermittent. Activity during March 2011. On 1 March, ashfall was reported E of Shinmoe-dake and a shockwave was felt 3 km from the crater. Ash was deposited to the SW on 3 March and on 13 March ash was reported 60 km E over the Sea of Hyuga. As the intensity of ejections tapered off on 22 March, the restricted zone was reduced from 4 km to 3 km. According to the monthly JMA report, a sensitive camera recorded night time glow from 1-14 March. SO2 flux averaged 1,300 tons/day on 2 March; however, on 8 March and six subsequent sampling days, the average was 200-500 tons/day. A total of 2,262 seismic events were recorded this month; continuous tremor was recorded from 28 February to 4 March. Activity during April 2011. Ballistics on 3 April impacted areas as far as 600 m from the crater and ash traveled E to the Hyuga Sea. Ash from 9 April extended ENE and reached a town 60 km from the crater. Ballistics on 18 April impacted the local region as far as 1 km W and N; ash was reported 60 km E, and lapilli reached 9 km from the crater, damaging solar heaters and roof panels in the town of Takaharu. According to JMA, the average SO2 flux on 2 and 21 April was 100-200 tons/day. A total of 3,840 seismic events were documented in the April report with hypocenters ~ 2 km below the crater; total tremor duration was 42 hours and 13 minutes. Activity during May 2011. On 13 May, the average SO2 flux was measured at 200 tons/day according to JMA. Seismic stations detected 1,784 events with hypocenters between 0-2 km above sea level near Shinmoe-dake. Total duration of tremor was 1 hour 9 minutes. Activity during June 2011. On 29 June, ash from an explosion was distributed N and reached the town of Itsuki ~ 50 km N from the crater. Ash from a 16 June eruption reached Takaharu and the city of Kobayashi, 15 km E of the crater. On the 23 June a smaller amount of ash was also observed in Kobayashi. No lapilli or ballistics were associated with these events. According to JMA, rainy weather (common in Japan during early summer) hampered direct observations of the crater. No gas or thermal data was collected. Seismic reports for June documented 4,096 events with hypocenters 0-2 km above sea level and the duration of tremor was 43 hours and 41 minutes. Activity during July 2011. According to news reports, on 6 July advisories were issued throughout SE Kyushu for torrential rain hazards. Poor weather reduced direct observations of crater activity. JMA reported 3,764 seismic events during this period with 41 minutes of tremor. Earthquake hypocenters were in the same range as past months (0-2 km). Tilt and geodetic data. Figure 16 plots multiple kinds of data collected during February-July 2011. During the reporting interval, tilt measurements typically indicated inflation on the flanks of Shinmoe-dake hours-to-several-days before explosive events occurred. Conversely, they recorded subsidence immediately after some eruptions. There were also cases of eruptions and explosive events not correlating with tilt. JMA interpreted tilt data as related to the intermittent ascent of magma moving from the chamber to the crater. GPS measurements since February 2011 by the Geospatial Information Authority of Japan suggested a deep magma supply centered several kilometers NW of Shinmoe-dake. Figure 16. Data describing Kirishima for February-July 2011. Plotted together are earthquake counts (per day), rainfall (mm), tilt, eruptions, and ash plumes. Key: tremor "x", explosive eruptions (red triangles), ash plumes (gray triangles), and tilt records showing N-S (red) and E-W (blue). Earthquake counts and rainfall are presented in the black histograms. Lower panels show possible correlation between earthquakes and rainfall that started around 4-6 July 2011. Courtesy of JMA. Multi-year seismic data. In the July report, JMA released continuous seismic data for Kirishima during June 2004 through July 2011. Epicenters were located for numerous earthquakes and appeared to concentrate within 2 km of the crater with depths less than 6 km (figure 17). Figure 17. Epicenters at Kirishima's Shinmoe-dake as reported by JMA for the interval January 2004 to July 2011. Locations and depths are displayed in cross-sections, including, at right, two plots of earthquakes as a time series, tracking location with time (the lower two rectangles consist of, at left, a conventional E-W cross section, and, at right, the same data in the form of a time series). Note key for shading of data points. Courtesy of JMA. During the explosive activity beginning in January 2011, more than 1,000 high frequency earthquakes occurred each month. High frequency (HF) earthquakes are defined as signals greater than 5 Hz (Ishihara and others, 2005). The total number of earthquakes increased and appeared to peak in June with 4,096 high-frequency earthquakes. Visible and thermal aerial observations. Rapid growth of a lava dome within the Shinmoe-dake crater began on 28 January and was closely monitored by aerial observations. Over the course of 3 days, the dome reached a volume of more than 107 m3 and sustained a diameter of ~ 600 m (BGVN 35:12). Collaboration between the Japan Ground and Air Self-Defense Force (JGSDF-JASDF) provided numerous thermal images as recent as 31 May. During four separate flights in May, white plumes were observed from the SE parts of the dome margin. These plumes reached 50-100 m above the crater rim. Infrared imagery taken during JGSDF-JASDF flights showed no major change since February regarding the heat distribution across the dome and within the crater region. The highest temperatures measured during these flights corresponded to the plume area and the size of the dome had not changed since emplacement. The Tokyo VAAC reported that on 23 and 29 June, eruptions from Shinmoe-dake produced plumes that rose to an altitude of 1.8 km and 1.8-2.4 km respectively, the first drifted E and the second drifted N. The VAAC reported another eruption on 6 August. Reference. Ishihara, K., Tameguri, T., Igushi, M., 2005, Automated Classification of Volcanic Earthquakes and Tremors-Outline of the system and preliminary experiment, Annuals of Disaster Prevention Research Institute, Kyoto University, No. 48C. Information Contacts: Volcano Research Center, Earthquake Research Institute (VRC-ERI), University of Tokyo, Yayoi 1-1-1, Bunkyo-ku, Tokyo 113, Japan (URL: http://www.eri.u-tokyo.ac.jp/topics/ASAMA2004/index-e.html); Japan Meteorological Agency (JMA), Otemachi, 1-3-4, Chiyoda-ku Tokyo 100-8122, Japan (URL: http://www.jma.go.jp/); Tokyo Volcanic Ash Advisory Center (VAAC), Tokyo, Japan (URL: http://ds.data.jma.go.jp/svd/vaac/data/); Yukio Hayakawa, Gunma University, Faculty of Education, Aramaki 4-2, Maebashi 371-8510, Japan; John Lyons, Michigan Technological University, Dept. of Geological and Mining Engineering and Sciences, 1400 Townsend Drive, Houghton MI, 49931, USA (URL: http://www.geo.mtu.edu/~jlyons/); News On Japan (URL: http://www.newsonjapan.com/); Japan Today (URL: http://www.japantoday.com/); Daily Mail (URL: http://www.dailymail.co.uk/). The early 2011 eruption of Shinmoe-dake (Shinmoedake) volcano of the Kirishima Volcanic Group was characterized by sub-Plinian and Vulcanian explosions and an ~600-m-diameter lava dome that was extruded into the crater (BGVN 35:12 and 36:07, reports covering through July 2011). Fewer eruptions occurred during an ensuing decline in activity, where plumes only rose to up to 1 km above the summit. No explosions (defined as accompanying an air shock larger than 20 Pa and explosive earthquake signals) were reported by the Japan Meteorological Agency (JMA) after 11 May 2011 and through June 2012. This report discusses diminishing plume emissions and seismicity during September 2011-June 2012, and supplies more context on the entire eruptive episode. The material in this report is based on JMA monthly reports, which are now available in English with coverage starting in October 2010. 2011 eruption wanes. After the explosive eruptions during January-February 2011, eruptions (ash emissions) at Shinmoe-dake occurred through 7 September 2011. After that, JMA reported no further eruptions at least through June 2012; gas-and-steam plumes rose to a maximum of ~600 m above the crater of Shinmoe-dake after 7 September 2011 (figure (18). Figure 18. Plume behavior and seismicity at Kirishima during intervals bracketing the explosive activity of January-May 2011. The inset plot shows daily maximum plume heights (black bars, in meters above the summit) and eruptions (red arrows) since 2008, with the yellow shaded area indicating the temporal coverage of the main plot. The main plot shows maximum plume heights per month (kilometers above sea level, km a.s.l., right axis, where gray bars indicate months in which plumes contained ash, and white bars indicate months in which ash was absent in all plumes) and seismicity (seismic events per month, black line, left axis). Coverage of previous Bulletin reports is indicated at the top of the plot. Data and inset plot courtesy of JMA. Elevated seismicity continued following the cease of explosive eruptions in May 2011, but a substantial protracted decline too place during August-November 2011. In May and June 2012, JMA reported that seismicity had returned to background levels seen prior to the onset of the early 2011 explosive activity, and they reported an absence of measured tremor over the same two months (figures 18 and 19). Figure 19. Kirishima's daily high-frequency (H-F) earthquake counts plotted with tilt measurements (E-W component shown in blue, N-S component shown in red), indications of tremor (black x's, top), ash eruptions (gray volcano symbols) and explosions (red volcano symbols) during January 2011-June 2012 at Shinmoe-dake. The black arrow indicates a tilt change of 4 microradians (µrad); the blue (E-W) and red (N-S) triangles indicate the start and end points of the tilt component records. Courtesy of JMA. JMA reported that GPS baseline extension indicated "magma supply to a deeper chamber several kilometers northwest of the crater" through December 2011; the baseline extension slowed after December. JMA initially reported almost no change after January 2012, but during June 2012 the baseline distance between Ebino (~16 km NNW) and Makizono (~14 km WSW) shortened. Observation flights conducted through various collaborations between the Japan Ground, Air, and Maritime Self-Defense Forces (JGSDF, JASDF, and JMSDF, respectively) and the Ministry of Land, Infrastructure, Transportation and Tourism (MLIT) allowed frequent aerial photography and infrared thermal measurements of the crater and edifice of Shinmoe-dake. The diameter of the lava dome within the crater remained ~600 m as of June 2012 (indicating little-to-no growth since 30 January 2011). Infrared thermal photography revealed little thermal structure to the dome, but highlighted comparatively high-temperature areas at its margins. A fissure (described as a "crack" by JMA) located on the W slope of the edifice was occasionally reported to emit plumes, and exhibited an elevated temperature compared with the rest of the edifice (figure 20). Similar aerial and thermal observations were reported as late as 10 May 2012. Figure 20. 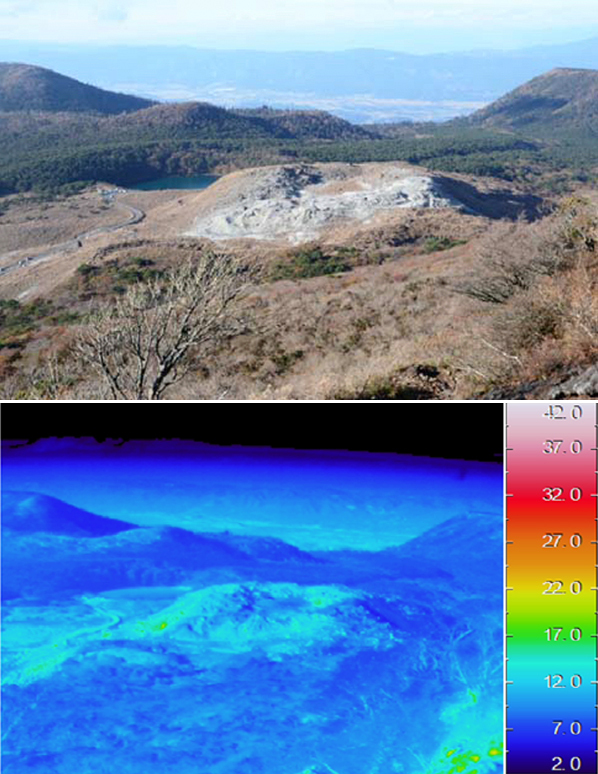 Aerial photograph (top) and infrared thermal image (bottom) of the summit of Shinomoe-dake volcano on 21 February 2012, illustrating a high-temperature anomaly that occurred within a fissure (described as a "crack" by JMA) on the W slope, where plumes were occasionally observed (labeled with '*'). For orientation, the same symbol is placed just S of the same approximate location in the aerial photo (top). Courtesy of JMSDF, MLIT, and JMA. The Alert Level remained at 3 (on a scale from 1-5) at the end of June 2012. Information Contacts: Japan Meteorological Agency (JMA), Otemachi, 1-3-4, Chiyoda-ku Tokyo 100-8122, Japan (URL: http://www.jma.go.jp/); Japan Ground Self-Defense Force (JGSDF) (URL: http://www.mod.go.jp/gsdf/english/index.html); Japan Air Self-Defense Force (JASDF) (URL: http://www.mod.go.jp/asdf/English_page/organization/formation01/); Japan Maritime Self-Defense Force (JMSDF) (URL: http://www.mod.go.jp/msdf/formal/english/index.html); Ministry of Land, Infrastructure, Transportation and Tourism (MLIT) (URL: http://www.mlit.go.jp/en/index.html). After an explosive eruption during January-September 2011, Shinmoe-dake (Shinmoedake), a stratovolcano of the Kirishimayama volcano group, was quiet except for gas-and-steam plumes and slowly decreasing seismicity that returned to baseline levels by May 2012 (BGVN 37:07). The following report summarizes events through December 2017, and relies primarily on reports from the Japan Meteorological Agency (JMA). 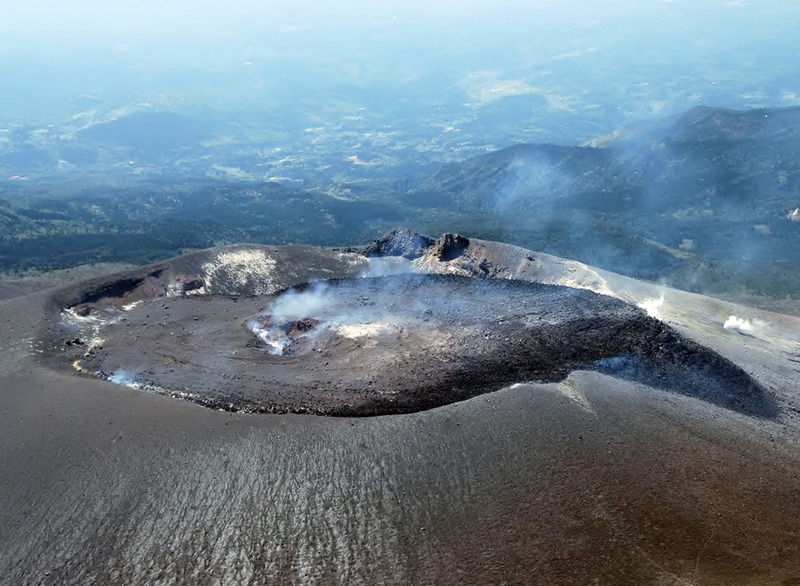 On 22 October 2013, JMA reported that no eruptions had been detected at the volcano since the eruption on 7 September 2011. Earthquake activity and sulfur dioxide emissions were both below the detection limit. The Alert Level was lowered from 3 to 2 (on a scale of 1-5). According to JMA, an eruption began at 0534 on 11 October 2017, prompting the agency to raise the Alert Level to 3 (figure 21). Ash plumes rose 300 m above the crater rim (2 km altitude) and drifted NE. Volcanic tremor amplitude increased and inflation was detected. Ashfall was noted in at least four towns in the Miyazaki (to the E) and Kagoshima (to the SW) prefectures. Based on JMA notices, pilot observations, and satellite data, the Tokyo Volcanic Ash Advisory Center (VAAC) reported that ash plumes rose to an altitude of 1.8-2.1 km on 11 October and 3.4 km on 12 October. Figure 21. An ash plume rises from the Shinmoedake crater at Kirishimayama after its eruption on 11 October 2017. Courtesy of Tomoaki Ito / Kyodo News. Gas measurements taken during field surveys on 12 and 13 October showed that the sulfur dioxide flux was 1,400 tonnes/day, an increase from 800 tonnes/day measured on 11 October. Volcanic tremor fluctuated but the amplitude was slightly lower. During 0823-1420 on 14 October, an event produced a tall plume which rose 2.3 km above the crater rim. Another event, at 1505, generated a grayish-white plume that rose 1 km and then blended into the weather clouds. Ashfall was reported in Kirishima (22 km SW) in the Kagoshima prefecture, in Kobayashi (14 km NE) in the Miyazaki prefecture, and reaching as far as Hyuga city (92 km NE). An increase in low-frequency earthquakes was recorded on 16 October. The eruption lasted almost continuously until the morning of 17 October. The eruption plume usually rose several hundred meters about the crater rim, though on 14 October the plume rose as high as 2.3 km. Sulfur dioxide flux exceeded 10,000 tonnes/day. Cloudy weather conditions prevented webcam views during 19-20 October. Plumes rose 200-600 m on 21, 23, and 24 October. During an overflight on 24 October, scientists observed a white plume rising from the active vent on the E side of the crater, and puddles in multiple low areas of the crater. Activity during 25 October-20 November 2017 activity continued to be slightly elevated. White plumes rose 100-500 m above the crater rim, though weather clouds sometimes prevented visual observations. Almost daily field surveys by JMA revealed no particular changes in the fumarolic and fissure areas near the cracks on the W flank, or to the thermally anomalous zone below the crack. Sulfur dioxide fluxes were as high as 200 tonnes/day. The Alert Level remained at 3. Information Contacts: Japan Meteorological Agency (JMA), Otemachi, 1-3-4, Chiyoda-ku Tokyo 100-8122, Japan (URL: http://www.jma.go.jp/); Tokyo Volcanic Ash Advisory Center (VAAC), 1-3-4 Otemachi, Chiyoda-ku, Tokyo, Japan (URL: http://ds.data.jma.go.jp/svd/vaac/data/); Associated Press (URL: https://www.ap.org/en-us); Kyodo News (URL: https://english.kyodonews.net). Kirishimayama is a large group of more than 20 Quaternary volcanoes located N of Kagoshima Bay, Japan (figure 22). For the last 1,000 years, repeated eruptions have taken place at two locations in the complex: the Ohachi crater on the W flank of the Takachihomine stratovolcano, and the Shinmoedake stratovolcano 4 km NW of Ohachi. 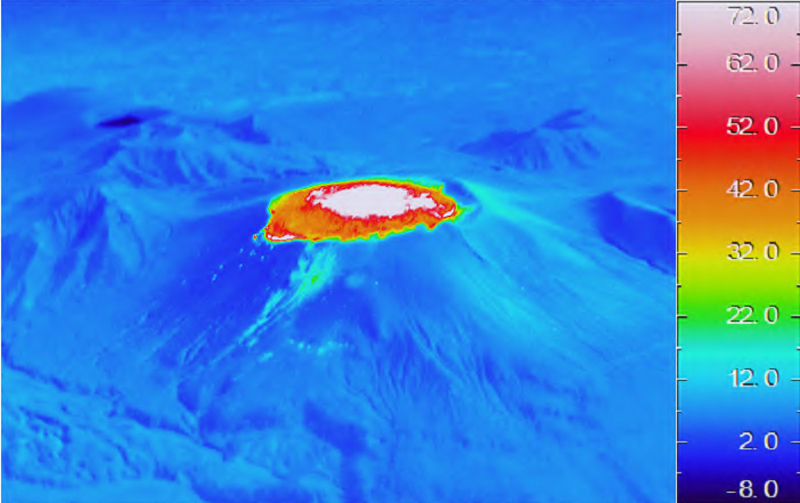 A single eruption was reported in 1768 from the Iwo-yama (Ebino Kogen) dome located on the NW flank of the Karakunidake stratovolcano, about 5 km NW of Shinmoedake. Figure 22. Subfeatures of the Kirishimayama volcanic complex showing the three areas with activity discussed in this report: Ohachi, Shinmoedake, and Iwo-yama (Ebino Kogen). View is to the SE. Image taken by the Japan Maritime Self Defense Force on 7 October 2014. Courtesy of JMA (Volcanic activity report on Kirishimayama, October, Heisei 26 ). The last confirmed eruption at the Ohachi crater was in July 1923. Intermittent steam plumes have been observed since then, including in December 2003 (BGVN 33:09), but the Japan Meteorological Agency (JMA) noted that it had been quiet since 1 December 2007. 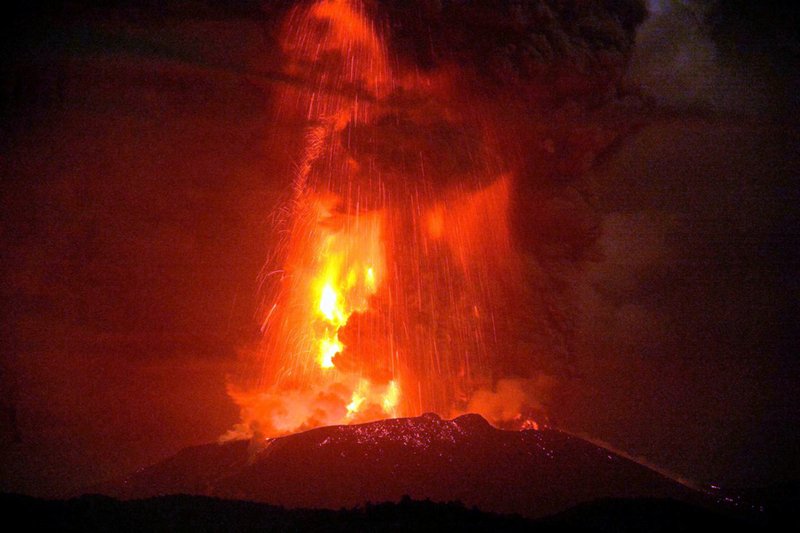 Shinmoedake has been the site of several short-lived eruptive events since 2008. Most of the events were single-day explosions with ash emissions (BGVN 35:12). A more protracted event from January to September 2011 included numerous explosions with ash plumes, which produced ashfall tens of kilometers away, the growth of a lava dome, ejecta of large blocks, and small pyroclastic flows (BGVN 36:07). Shinmoedake remained quiet until seismicity increased on 23 September 2017, followed by several explosions during October 2017 (BGVN 43:01). Seismic unrest was first reported from the area around Iwo-yama in December 2013, and it has been regularly monitored since that time. This report covers activity from November 2017 through May 2018 and includes new explosive events at Shinmoedake during March-May 2018, an explosive event at Iwo-yama in April 2018, and a brief increase in seismicity at Ohachi in February 2018. Information is provided primarily by the JMA and the Tokyo Volcanic Ash Advisory Center (VAAC), with additional satellite data and news media reports. Summary of activity during November 2017-May 2018. After steam plumes disappeared at Ohachi in mid-2006, only minor intermittent seismicity was reported through 2017. A sudden increase in earthquakes and tremor activity on 9 February 2018 led JMA to raise the 5-level Alert Level system from 1 (potential for increased activity) to 2 (do not approach the crater) for about a month. Activity diminished after the middle of February and Ohachi remained quiet through May 2018, with only a continuing modest thermal anomaly at the crater. The latest eruptive episode at Shinmoedake, during 11-17 October 2017, generated an SO2 plume recorded by NASA satellites, caused ashfall up to 100 km away, and created a new vent about 80 m in diameter on the E side of the crater. Intermittent earthquakes and tremors along with low-level steam plumes characterized activity during November 2017-February 2018. 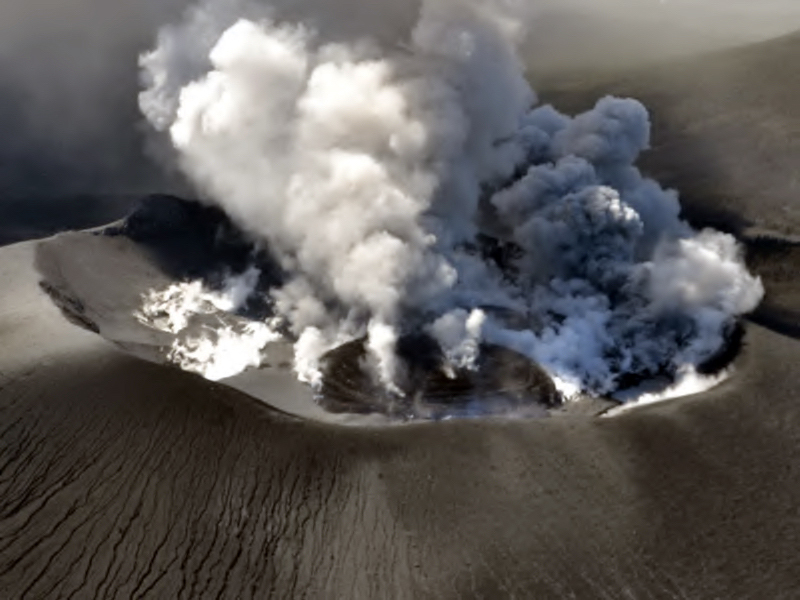 A new eruptive episode began on 1 March 2018 with near-constant explosive activity that lasted until 10 March. A new lava flow at the summit was first observed by JMA on 6 March and began to overflow the NW rim of the crater on 9 March. The Tokyo VAAC reported ash plumes over 6 km altitude on 10 March. An explosion on 5 April produced the largest ash plume of the period; it rose to 10.1 km altitude, was visible drifting E for 24 hours, and resulted in significant ashfall in the region. The lava flow had ceased advancing down the NW flank by the end of April. Another explosion on 14 May 2018 generated an ash plume that rose to 7.3 km altitude and caused ashfall 30 km S that covered the roadways. An increase in seismicity at Iwo-yama in December 2013, followed by a 7-minute-period of tremor activity in August 2014 was the first recorded at the site since 1768. Thermal anomalies and weak fumarolic activity first appeared in December 2015. Seismicity, including intermittent tremor events and larger amplitude earthquakes, gradually increased during 2016 and 2017. Intermittent fumarolic activity and temperature anomalies began to increase measurably in mid-2017. 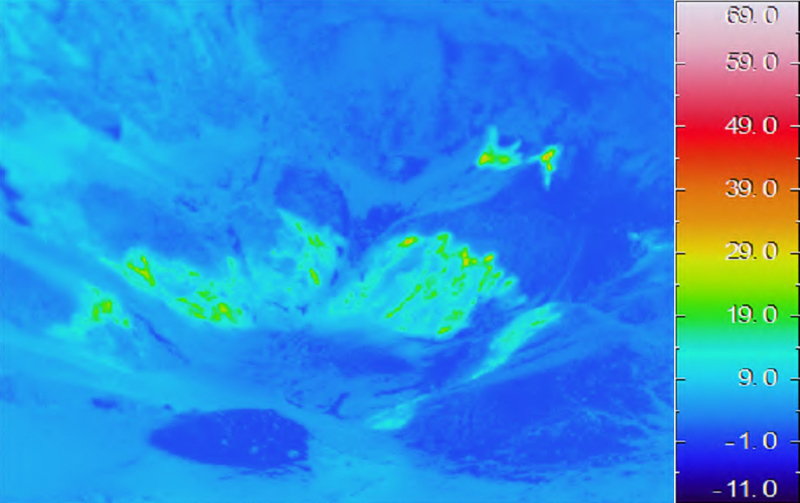 Jets of sediment-laden hot water emerged from several vents early in 2017. A further increase in fumarolic activity and the temperature of the thermal anomalies in February 2018 led JMA to raise the Alert Level at Iwo-yama. Large amplitude earthquakes and a tremor event accompanied an ash-bearing explosion on 19 April 2018 from a vent on the S side of Iwo-yama. The following day, a vent opened 500 m to the W and produced vigorous steam emissions. On 26 April 2018 an explosion from the new vent sent ash 200 m high. Jets of hot water continued at the Iwo-yama vents through May 2018. Activity at Ohachi during 2003-May 2018. JMA reported tremor activity with epicenters near Ohachi in mid-December 2003 (BGVN 33:09) that was followed by fumarolic activity for a few weeks. Intermittent steam plumes were observed during 2004; on 26 March 2004 a tremor event lasted for four hours and a steam plume rose 800 m above the crater (figure 23). A few periods of microtremor were recorded, and intermittent fumarolic activity was observed with webcams until March 2006, after which most activity ceased. JMA lowered the 5-level Alert Level from 2 (Do not approach the crater) to 1 (Potential for increased activity) on 22 May 2006. Fumarolic activity was not observed after July 2006, and no new thermal activity was reported during a field visit in October 2006. Minor seismicity was reported for a few days during July 2007, and small-amplitude, short-duration tremor activity was occasionally recorded during 2008-2014. Figure 23. Steam plumes were visible on the NW side of the Ohachi crater at Kirishimayama on 31 March 2004. Courtesy of JMA (JMA Kirishimayama annual report, Heisei 16 (2004)). Although earthquake activity increased slightly in July 2015, the warning level was not raised, and no surface fumarolic activity was observed during field visits in August and September 2015 (figure 24). Seismic activity remained elevated at Ohachi through February 2016 and then gradually decreased during March. Although tremors were recorded in May and December 2016, there was no change in condition at the site and seismicity continued to decrease; no tremors were recorded during 2017. Figure 24. No fumarolic activity was visible at the Ohachi crater at Kirishimayama on 18 September 2015 during a site visit. View is to the NW. Courtesy of JMA (JMA Kirishimayama annual report, Heisei 27 (2015)). Earthquake frequency on the SW side of Ohachi increased during 9-16 February 2018, resulting in 199 seismic events, and tremor activity was also recorded on 9 February. This activity led JMA to increase the Alert Level to 2 on 9 February 2018. In spite of the increased seismic activity, the thermal activity remained unchanged from previous months with continued minor thermal anomalies in the same areas as before (figure 25). Seismicity decreased significantly during March 2018 to only 13 volcanic earthquakes, and no microtremor activity was recorded. Inspections carried out on 11 and 14 March showed no surface changes (figure 26) and resulted in JMA lowering the Alert Level back to 1 on 15 March 2018. Ohachi remained quiet through May 2018. Figure 25. Thermal anomalies at the Ohachi crater of Kirishimayama were unchanged compared with previous months when measured on 9 February 2018 in this view to the NW. Courtesy of JMA (Volcanic activity commentary on Kirishimayama, February, Heisei 30 (2018)). Figure 26. An overview looking W of the Ohachi crater at Kirishimayama on 2 March 2018 showed no surface activity after the increased seismicity of February. Courtesy of JMA (Volcanic activity commentary on Kirishimayama, March, Heisei 30 (2018)). Activity at Shinmoedake during August 2008-October 2017. An explosion on 22 August 2008 lasted for about six hours and produced ashfall in Kobayashi City (10 km NE) (BGVN 33:09). Seismicity had increased rapidly a few days prior to the explosion, and then decreased gradually for the remainder of 2008. Other than a brief increase in seismicity in May the following year, only steam plumes rising about 100 m from the crater were reported for 2009. Seven small ash-bearing explosive events were reported during March-July 2010. Small-amplitude tremor activity on 30 March 2010 was accompanied by a plume that rose 400 m above the crater rim; a small amount of ash fell 400 m to the W of the fumarole within the crater. The webcam on the S rim of the crater captured a grayish plume rising 300 m after a small explosion on 17 April 2010. Another small explosion on 27 May produced a grayish-white plume that rose 100 m above the crater rim and resulted in minor ashfall NE in Kobayashi City. Officials noted a new fumarole on the W flank after this event. Two more explosions on 27 and 28 June 2010 resulted in a small amount of ash deposited 10 km E of Shinmoedake. A small explosion was reported on 5 July. On 10 July, a grayish-white plume, observed in the webcam, rose 100 m above the crater rim after an explosion, and a small low-temperature pyroclastic surge flowed 300 m down the SW slope. GPS instruments recorded minor inflation from December 2009 through September 2010. 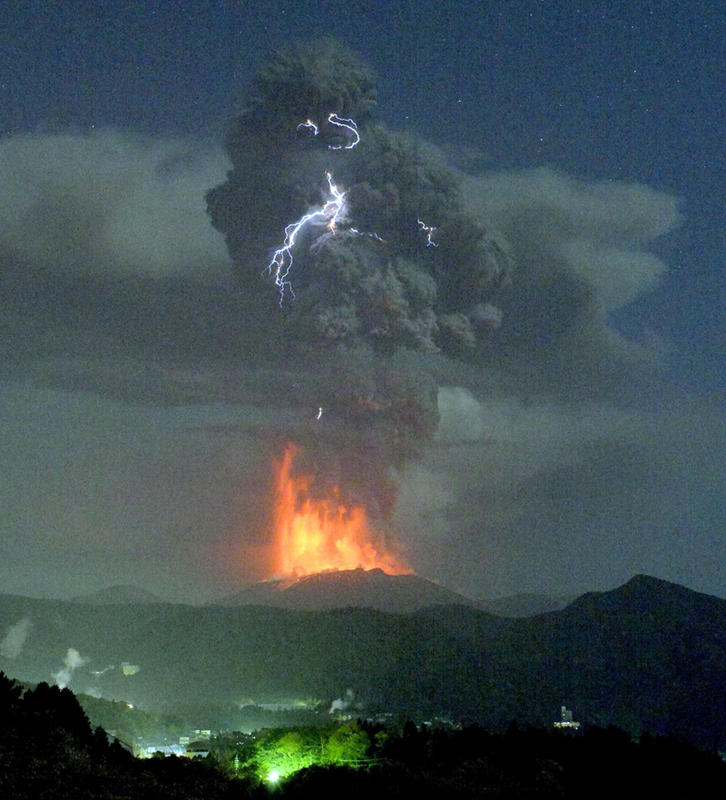 A new, more substantial, eruption began at Shinmoedake on 19 January 2011. Activity increased on 26 January with an explosion that released a large volume of ash and pumice and included the growth of a new lava dome (BGVN 35:12, 36:07). Thirteen additional explosions occurred through 1 March 2011. Activity became more intermittent after mid-February, and the last emission was reported on 7 September 2011. Seismicity declined significantly in March 2012 and had returned to background levels by May 2012. 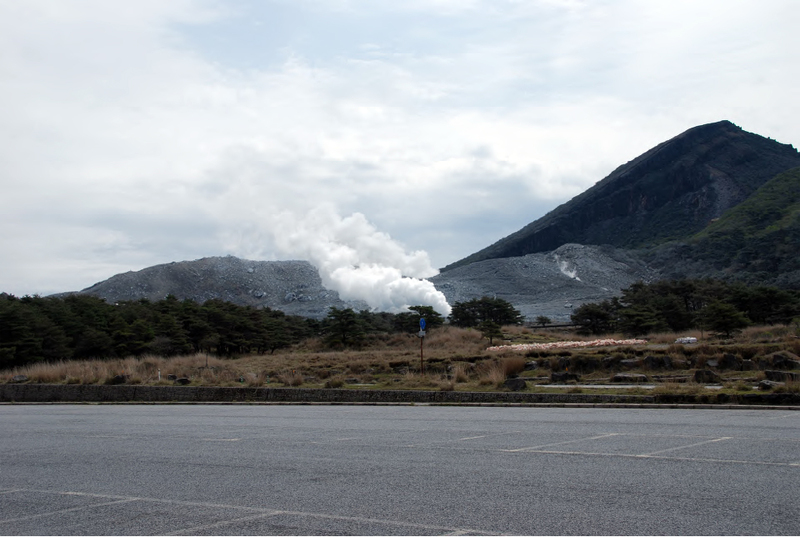 With no surface changes and very low seismicity, JMA reduced the Alert Level from 3 to 2 on 22 October 2013, and the only reported activity was steam plumes rising 50-200 m above the crater rim during 2013. 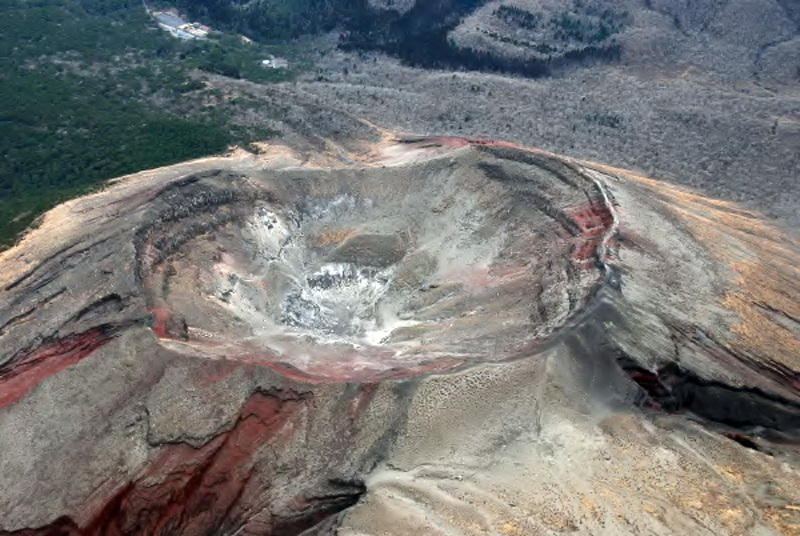 The lava dome in the crater remained about 600 m in diameter. Inflation had slowed and stopped after December 2011 but began again around December 2013. Shallow, low-level seismicity during 2014 with epicenters near Shinmoedake was distributed within a few kilometers below the summit; there were no surface changes observed at the crater during several overflights conducted by the Japan Maritime Self Defense Force throughout the year. 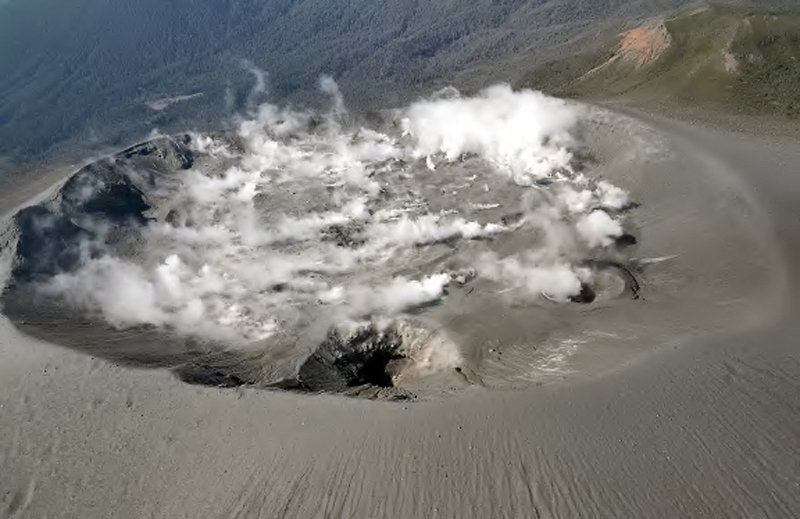 Occasional steam plumes rising 400 m above the crater rim were reported during 2015. Volcanic earthquakes were intermittent, with brief increases in activity during March-May and October- December with roughly the same number as the previous year. Inflationary deformation that began around December 2013 ceased in January 2015. A very brief tremor on 1 March 2015 was the first recorded since 1 February 2012. During 2016, occasional steam plumes rose 300 m above the crater. In spite of a seismic swarm on 23 February 2016, and a general increase in seismicity throughout the year, no eruptions occurred, and no surface changes were observed. JMA kept the Alert Level at 2 throughout the year. A small tremor event on 17 September was the only recorded during 2016. Very little activity was reported from January to September 2017; occasional steam plumes were reported rising 400 m above the crater rim. JMA lowered the Alert Level from 2 to 1 on 26 May 2017. A minor increase in seismicity was observed beginning in July 2017, and was followed by a marked increase on 23 September. After a further increase in frequency and amplitude of earthquakes on 4 October, JMA raised the Alert Level to 2 for Shinmoedake on 5 October 2017. This was followed by an eruption that began on 11 October 2017. A new vent was observed on the E side of the crater during an overflight that same day, and ashfall was reported in numerous communities as far as 90 km NE (BGVN 43:01). 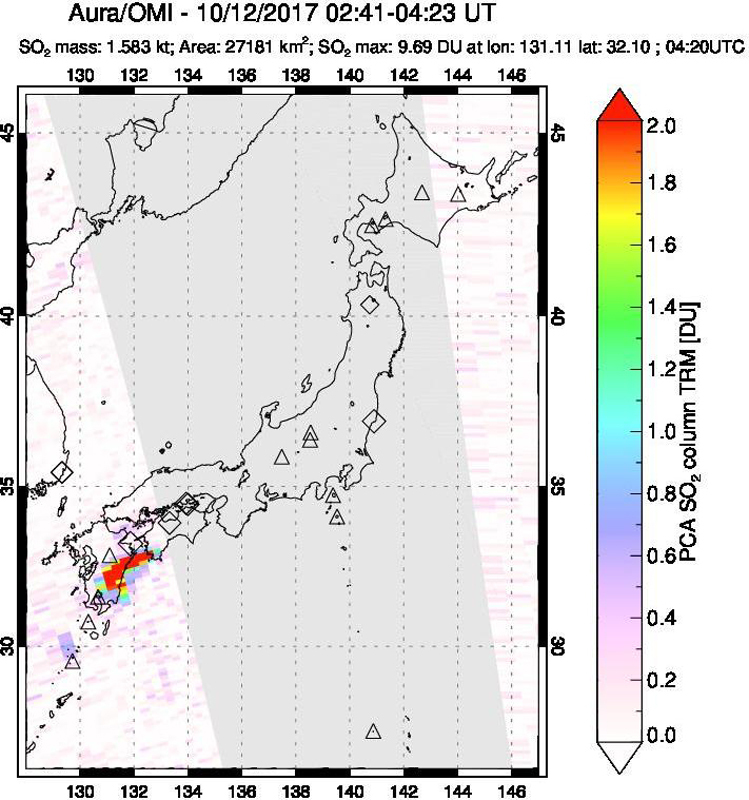 A significant SO2 plume was measured by the OMI instrument on the Aura satellite the following day (figure 27). After raising the Alert Level to 3 on 11 October, JMA expanded the restricted area radius from 2-3 km during 15-31 October. Figure 27. A significant SO2 plume from the explosion at the Shinmoedake crater of Kirishimayama was measured on 12 October 2017 by NASA's OMI instrument on the Aura satellite. Courtesy of NASA Goddard Space Flight Center. Explosions on 14 October 2017 resulted in confirmed ashfall in Kagoshima city (50 km SW), Takahara Town (15 km E), Kobayashi city (25 km NE), Saito city (55 km NE), Hyuga city (90 km NE), and Misato town (75 km NE). Ongoing explosions continued until 17 October, after which persistent steam plumes were observed rising as high as 600 m above the crater. In an overflight conducted on 23 October JMA scientists noted the new vent was about 80 m in diameter, and ejecta from the vent had formed a small cone around the vent. (figure 28). Figure 28. Two vents were visible on the E side of the crater in this view to the WNW taken on 23 October 2017 of Shinmoedake crater at Kirishimayama. 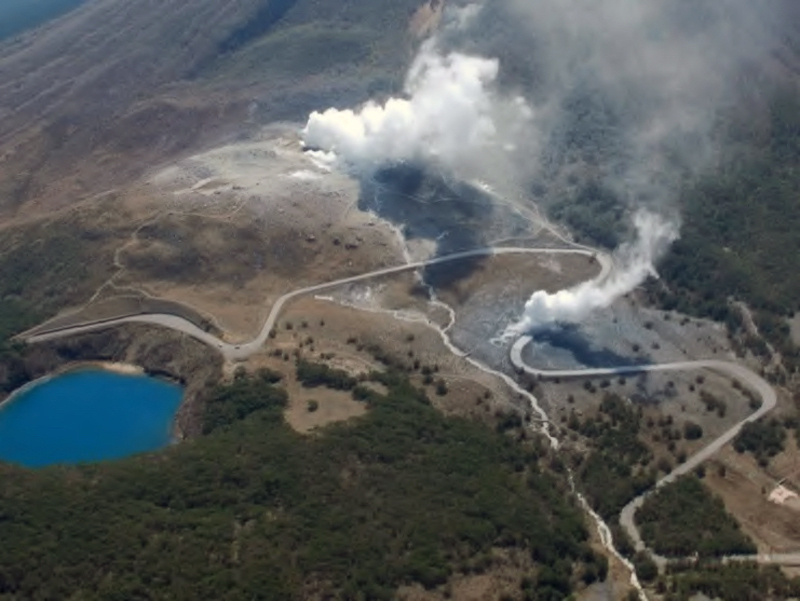 The left vent (center front) had formed during the 2011 eruption, and the right vent formed during the 11-17 October 2017 eruption earlier in the month. Courtesy of JMA (Volcanic activity commentary on Kirishimayama, October, Heisei 29 (2017)). Activity at Shinmoedake during November 2017-March 2018. After the eruption of 11-17 October 2017 seismicity decreased significantly, and no morphological changes were observed for the remainder of the year. Steam plumes rose 300-500 m above the crater during November and December. Short-duration tremors were detected during 25-29 November, along with a slight increase in the number of volcanic earthquakes. A small earthquake swarm recorded during 2-4 December was the only significant seismic activity that month. Infrequent, large-amplitude earthquakes were recorded during 15-17 January 2018, along with a few short-duration tremor events, the first since 29 November 2017. The earthquakes were located within a 1 km radius of Shinmoedake, around 2-4 km deep. Steam plumes at the crater rose no more than 100 m most days; occasional plumes rising as high as 200 m were noted. An earthquake swarm on 25 February was the first notable event of the month; the steam plumes remained under 100 m above the crater, except for a 500-m-high plume on 21 February. Thermal imaging surveys in late February indicated a modest increase in heat flow from fractures inside the crater and on the W slope compared with previous measurements. Earthquakes with shallow epicenters below Shinmoedake increased in number early on 1 March 2018 and a new eruptive episode followed a few hours later, leading JMA to increase the restricted zone to 3 km around the crater (figure 29). SO2 emissions also increased sharply. By the afternoon of 1 March an ash plume rose 1,500 m above the crater, emerging from the vent on the E side and drifting SE. Ashfall was confirmed on 1 March in the area up to 18 km E of the crater. Large blocks of ejecta were observed within the crater on 5 March. Figure 29. A new eruptive episode at the Shinmoedake crater of Kirishimayama began around 1100 on 1 March 2018 with ash emissions emerging from the new vent on the E side of the crater. Courtesy of JMA (Volcanic activity commentary on Kirishimayama, February, Heisei 30 (2018)). During an overflight on 6 March 2018, JMA witnessed a new lava flow covering a large area on the E side of the crater floor (figure 30). Eighteen explosive eruptions occurred on 6 March and JMA reported that the ash plume rose 2,800 m above the crater (figure 31). Ashfall was confirmed SW of Shinmoedake in Shibushi city (50 km SSE), Tarumizu City (50 km SSW) and Aira City (30 km SW). NASA 's Aqua satellite captured a false color image of the eruption on 6 March showing the ash plume drifting SE and SW from Shinmoedake (figure 32). About 80 flights in and out of nearby Kagoshima airport were canceled. Figure 30. Lava emerged from the new vent on the E side of the Shinmoedake crater at Kirishimayama on 6 March 2018 in this view to the W. Plumes of both ash and steam rose from the center and N sides of the crater. Courtesy of JMA (Volcanic activity commentary on Kirishimayama, February, Heisei 30 (2018)). Figure 31. Ash and steam rose from newly emergent lava inside the summit crater of Shinmoedake at Kirishimayama on 6 March 2018, and disrupted air traffic for most of the day. Courtesy of Kyodo News via AP. Figure 32. NASA 's Aqua satellite captured a false color image of the eruption from Shinmoedake crater at Kirishimayama on 6 March 2018 with an ash plume drifting SE and SW. Courtesy of NASA Earth Observatory. Tremor events occurred continuously over 1-8 March; forty-seven explosions were recorded between 6 and 8 March; they decreased in frequency after the middle of the month. The OMI instrument on the NASA Aura satellite recorded a significant SO2 plume on 7 March 2018 (figure 33). Geospatial data that had shown a gradual inflation of the Kirishimayama complex since July 2017 showed a sharp deflation during 6-7 March 2018, after which inflation resumed. Figure 33. An SO2 plume with a density of almost ten Dobson Units (DU) was recorded by the OMI instrument on the Aura satellite on 7 March 2018. Courtesy of NASA Goddard Space Flight Institute. During an overflight on 9 March 2018, a staff member from the Geographical Survey Institute observed the lava flow beginning to overflow the NW side of the crater (figure 34). Explosions resulted in ejecta traveling 800 m from the crater on 9 March and an ash plume rising 3,200 m. An increase in the intensity of activity the following day sent ejecta 1,800 m from the vent and generated an ash plume that rose 4,500 m (figure 35); this led JMA to increase the restricted area around the crater to 4 km between 10 and 15 March. Figure 34. The new lava flow began to overtop the NW side of Shinmoedake crater (left side of crater with steam) at Kirishimayama on 9 March 2018. Photographed by a staff member from the Geographical Survey Institute during a helicopter overflight by the Kyushu Regional Development Bureau. Courtesy of the Geographical Survey Institute (Correspondence on the eruption of Kirishimayama (Shinmoedake) in Heisei 30 (2018), 29 March 2018). Figure 35. An increase in explosive activity at the Shinmoedake crater of Kirishimayama on 10 March 2018 sent an ash plume 4,500 m above the crater (left), and incandescent ejecta 1,800 m from the vent (right). Courtesy of JMA (Volcanic activity commentary on Kirishimayama, March, Heisei 30 (2018)). A thermal image taken on 11 March showed that the lava was moving very slowly down the NW flank, advancing only a few tens of meters since 9 March (figure 36). 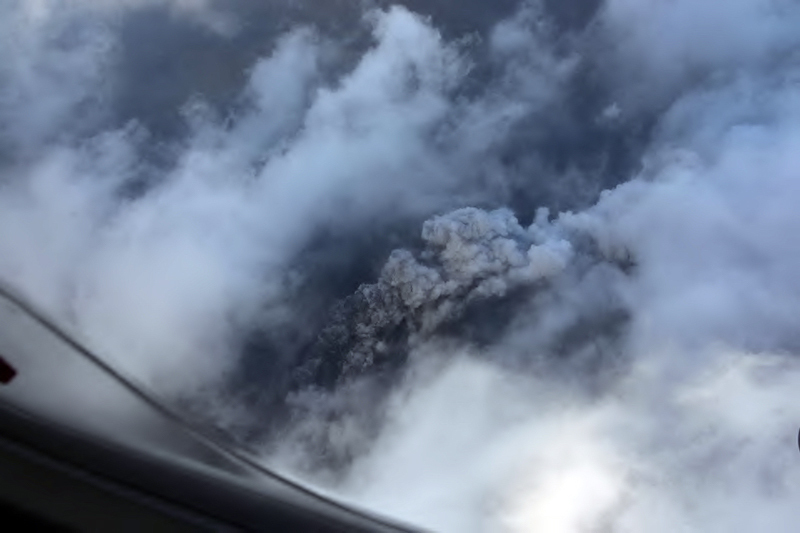 JMA confirmed during an overflight on 14 March that the lava flowing down the NW flank was about 200 m wide. Two explosions on 25 March produced plumes that rose 3,200 and 2,100 m, ejecta that traveled 800 m, and a small pyroclastic flow that advanced about 400 m down the W flank (figure 37). Although analysis of satellite data by Japan's Geographical Survey Institute suggested that the eruption of lava into the crater had ceased by 9 March, it continued to flow slowly down the NW flank for several weeks. The diameter of the flow inside the crater was about 700 m, and it had traveled about 85 m down the NW flank by 28 March (figure 38). Figure 36. A thermal image taken on 11 March 2018 of the new lava flow in the Shinmoedake crater at Kirishimayama showed the slow movement of the flow over the NW rim and down the flank a few tens of meters in two days. Courtesy of JMA (Volcanic activity commentary on Kirishimayama, March, Heisei 30 (2018)). Figure 37. Two explosions on 25 March 2018 from Shinmoedake crater at Kirishimayama produced plumes that rose 3,200 and 2,100 m, ejecta that traveled 800 m, and a small pyroclastic flow that advanced about 400 m down the W flank (foreground). Courtesy of JMA (Volcanic activity commentary on Kirishimayama, March, Heisei 30 (2018)). Figure 38. Lava was still slowly moving down the NW flank of the Shinmoedake crater at Kirishimayama on 26 March 2018, and gray ash covered much of the adjacent flank, possibly from a pyroclastic flow the previous day. Courtesy of JMA (Volcanic activity commentary on Kirishimayama, March, Heisei 30 (2018)). The Tokyo VAAC issued multiple daily reports from 1-15 March 2018, and a few intermittent reports during the rest of the month. JMA usually reports plume heights in meters above the crater and the Tokyo VAAC reports them as altitudes above sea level; conversions are noted where the height or altitude of a plume is exceptional. They reported an ash plume drifting SE on 1 March at 1.5 km altitude; the plume had risen to 2.4 km by the end of the day. The following day a plume was visible in satellite images at 2.1 km altitude drifting E. Continuous emissions drifting NE above 2.4 km altitude were reported on 3 and 4 March. Several explosions generated plumes that were visible in satellite imagery during 5-7 March drifting S, SW, and W at altitudes between 3.0 and 4.6 km. Plumes from larger explosions during 9 and 10 March rose to altitudes between 4.3 and 6.1 km and drifted SE, finally dissipating after about 24 hours. Explosions on 12 and 13 March drifted NE and E at 3.4-4.9 km altitude, with continuous emissions visible in satellite imagery during those days. Two explosions on 24 March produced plumes that drifted SE at 3.7 and 4.9 km altitude, and were visible in satellite imagery until they dissipated the next day. A strong MIROVA thermal anomaly signal appeared at the beginning of March and slowly tapered off into April. The signal is consistent with the reports of the eruption of lava from the summit of Shinmoedake and its gradual cooling (figure 39). The MODVOLC thermal alert signals also closely match the reports of the eruption of the lava. The first six alerts were issued on 6 March, four each on 9 and 10 March, three each on 11 and 12 March, and one each on 13, 14, 16, 23, and 30 March, matching a gradual cooling pattern for the lava after the main eruptive event. Figure 39. A strong MIROVA thermal anomaly signal appeared at Kirishimayama at the beginning of March and slowly tapered off into April 2018. The signal is consistent with the reports of the eruption of lava from the summit of Shinmoedake, and its gradual cooling. 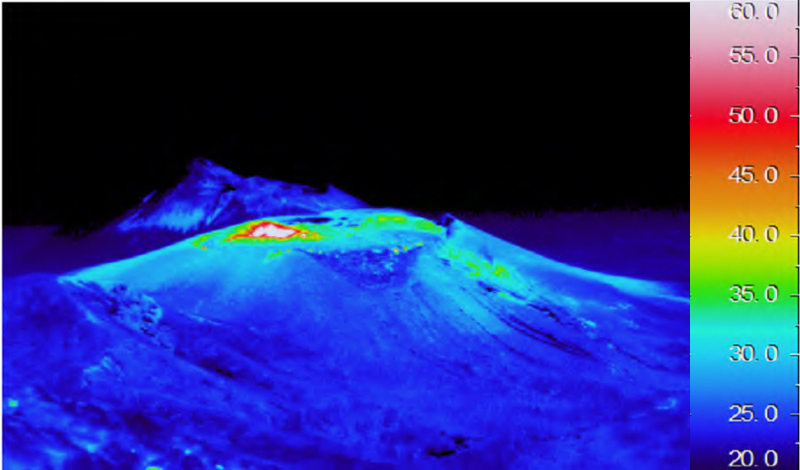 A thermal image of the lava flow at Shinmoedake from 28 March 2018 (inset) shows significant cooling from two weeks earlier (see figure 36). Courtesy of MIROVA and JMA (Volcanic activity commentary on Kirishimayama, March, Heisei 30 (2018)). Activity at Shinmoedake during April and May 2018. A new explosion on 5 April 2018 generated a large ash plume that rose 5,000 m above the crater; a small pyroclastic flow traveled 400 m down the SE flank, and ejecta was thrown 1,100 m from the vent (figure 40). The Tokyo VAAC reported an explosion, and an ash plume at 6.7 km altitude drifting E visible in satellite imagery early in the day. A few hours later, the plume was visible at 10.1 km altitude, or more than 8,000 m above the crater. Incandescent tephra was ejected hundreds of meters high, and lightning was observed within the large ash plume (figures 41 and 42). 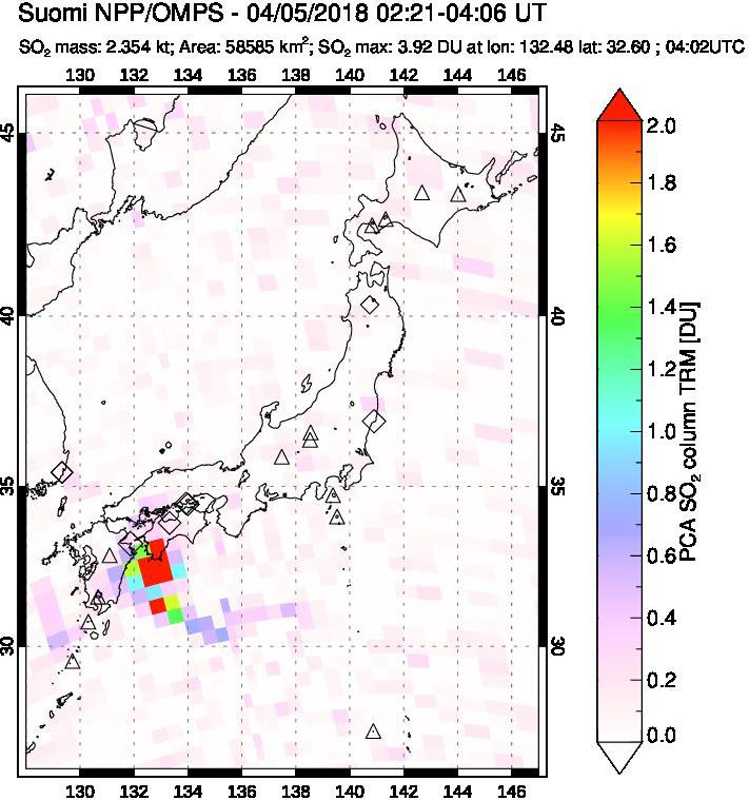 The plume was observed continuously in satellite images for almost 24 hours before dissipating; a significant SO2 plume was also recorded (figure 43). Figure 40. Ejecta was thrown 1,100 m from the vent in an explosion at the Shinmoedake crater of Kirishimayma on 5 April 2018 (farthest right incandescence). A large ash plume (to the right of the main incandescence) eventually rose to over 8,000 m above the crater. View is to the N from the Inogishi webcam. Courtesy of JMA (Volcanic activity commentary on Kirishimayama, April, Heisei 30 (2018)). Figure 41. An explosion on 5 April 2018 from the Shinmoedake crater at Kirishimayama sent incandescent ejecta several hundred meters above the crater. Courtesy of Kyodo News via Reuters. Figure 42. 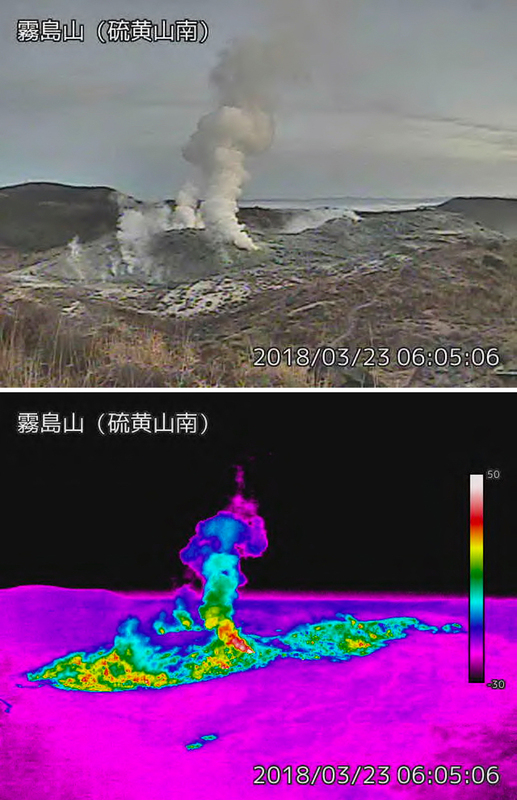 Significant lightning was reported in the large ash plume from the 5 April 2018 explosion at the Shinmoedake summit crater at Kirishimayama. Courtesy of Kyodo News via Reuters. Figure 43. The OMPS instrument on the Suomi NPP satellite recorded an SO2 plume drifting SE after the 5 April 2018 explosion at the Shinmoedake crater of Kirishimayama. Courtesy of NASA Goddard Space Flight Center. A large amount of ashfall was reported in parts of Kobayashi city and Takaharu (15 km E) (figures 44 and 45) on 5 April 2018. Ashfall reports also indicated that a wide area to the N of Shinmoedake including Hitoyoshi City (30 km N), to the NE including Kadogawa Town (95 km NE), and to the E including Miyazaki City (50 km E) were also affected. Another eruption took place the following day, on 6 April, but weather clouds obscured views of the summit. 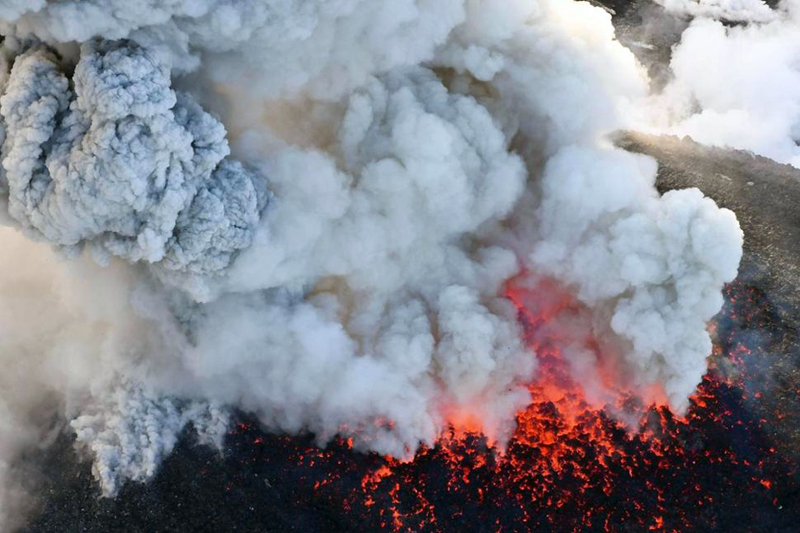 No eruptions were recorded after 6 April for the remainder of the month. Figure 44. Ashfall was measured and sampled on 5 April 2018 in Kobayashi City (25 km NE) after an explosion with a large ash plume rose from the Shinmoedake crater at Kirishimayama. Courtesy of JMA (Volcanic activity commentary on Kirishimayama, March, Heisei 30 (2018)). Figure 45. Ashfall covered major roadways and buildings in Takaharu, 15 km E of Kirishimayama, after an explosion from the Shinmoedake crater on 5 April 2018. Courtesy of JMA (Volcanic activity commentary on Kirishimayama, March, Heisei 30 (2018)). In multiple flyovers, on 19, 20, and 21 April 2018, authorities observed lava continuing to flow down the NW flank (figure 46), along with residual high temperatures in the central part of the lava flow (figure 47). Additionally, fumarolic areas around the fractures on the W slope persisted. By the end of April, the flow on the NW flank of the crater was 150 m long. Seismicity had declined at the end of March, but increased again during the explosive period in early April. Occasional tremors were recorded during 5-14 April. Intermittent spikes of around 100 small earthquakes were also recorded on 14 and 21 April. Figure 46. The lava flow down the NW flank of Shinmoedake crater at Kirishimayama was nearly stagnant by 21 April 2018, as seen in this view to the SW taken that same day by the Miyazaki Prefecture Disaster Preparedness Emergency Air Corps. Courtesy of JMA (Volcanic activity commentary on Kirishimayama, April, Heisei 30 (2018)). Figure 47. Residual high heat flow was still visible near the center of the Shinmoedake crater of Kirishimayama on 21 April 2018 but the lava flow had cooled significantly since March (compare with figure 36). Courtesy of JMA (Volcanic activity commentary on Kirishimayama, April, Heisei 30 (2018)). Another spike in earthquakes with epicenters within 2 km of Shinmoedake occurred on 2 May 2018 with over 700 events recorded. 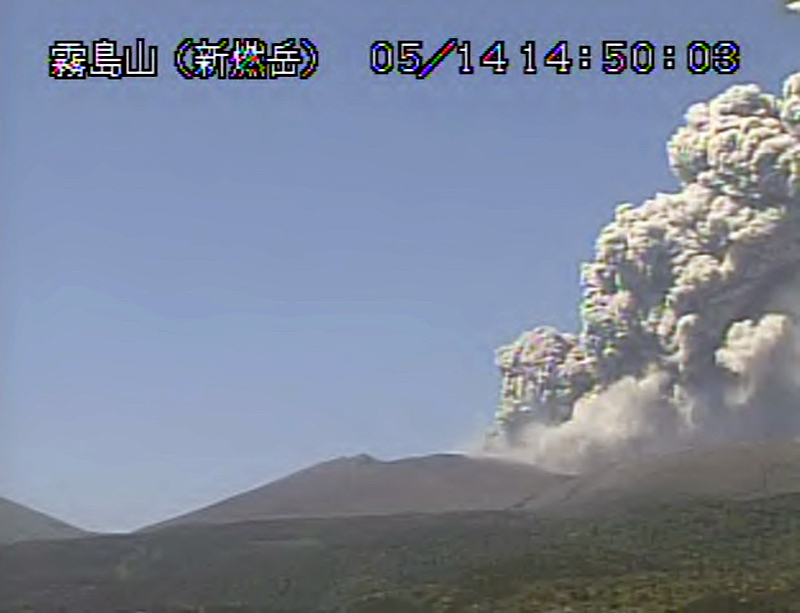 A substantial explosion on 14 May generated an ash plume that rose 4.5 km above the crater according JMA (figure 48). The Tokyo VAAC reported the ash plume initially at 4.9 km altitude drifting SE based on webcam reports; when the plume appeared in satellite data a short time later it was drifting SE at 7.3 km altitude and was continuously visible in satellite imagery for about 24 hours before dissipating. Ashfall was confirmed in numerous areas of the Miyazaki prefecture to the E, and the Kagoshima prefecture to the S and W. Seismicity increased briefly after the explosion. Enough ash fell in Miyakonojo City (30 km S) that it covered the white lines on the roadways (figure 49). A thermal image taken on 15 May showed a new high-heat flow area on the E side of the new lava flow inside the crater that JMA concluded was likely the result of the explosive event of the previous day (figure 50). Figure 48. A large explosion at the Shinmoedake crater of Kirishimayama on 14 May 2018 sent an ash plume to 4,500 m above the crater as seen in this view to the NE from the Inogishi webcam. Courtesy of JMA (Volcanic activity commentary on Kirishimayama, May, Heisei 30 (2018)). Figure 49. 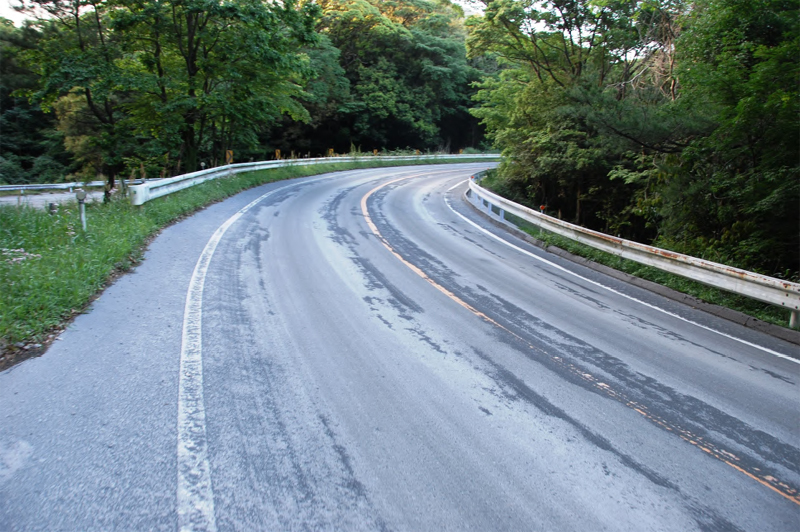 Enough ash fell in Miyakonojo City (30 km S) after an explosion at Shinmoedake crater of Kirishimayama on 14 May 2018, that it covered the white lines on the roadways. Courtesy of JMA (Volcanic activity commentary on Kirishimayama, May, Heisei 30 (2018)). Figure 50. The thermal signature at Shinmoedake crater at Kirishimayama on 15 May 2018 revealed a high-heat flow area that JMA concluded likely resulted from the explosion the previous day. Courtesy of JMA (Volcanic activity commentary on Kirishimayama, May, Heisei 30 (2018)). Activity at Iwo-yama during 2014-2017. An increase in seismicity around Iwo-yama, on the NW flank of the Karakunidake stratovolcano (figure 22) beginning in December 2013 was noted by JMA. The epicenters were distributed from 1-6 km below Iwo-yama. Satellite measurements suggested minor inflation in the area around Karakunidake beginning in December 2013, which lasted until January 2015. A 7-minute-long tremor event occurred near Iwo-yama on 20 August 2014. Although inspections of the area by JMA revealed no thermal or fumarolic activity, they listed the Iwo-yama area with an unofficial Alert Level of "Danger around the crater" on 24 October 2014, equivalent to the official Alert Level 2. They modified the warning during May 2015 to "Normal, keep in mind, it is an active volcano," the same as the official Alert Level 1. During the second half of 2015 there were occasional earthquakes and tremors reported in the area, but no surface or thermal activity was recorded (figure 51) until December. 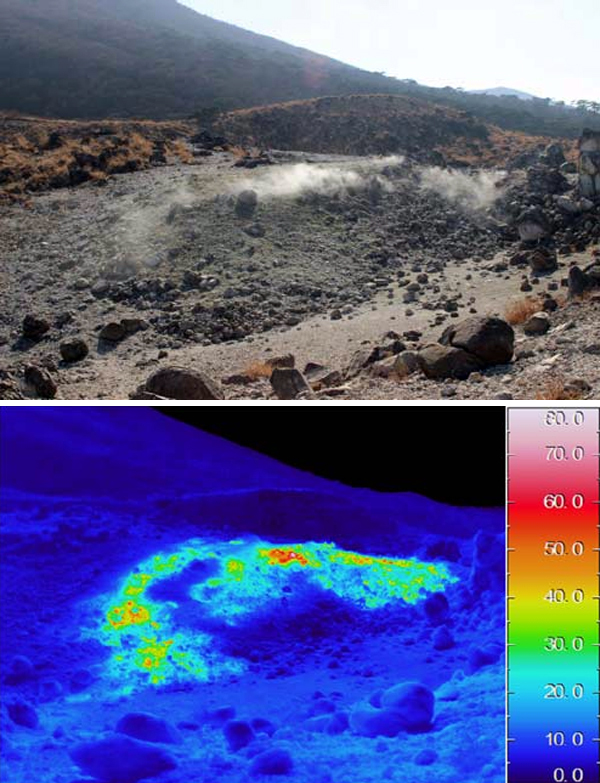 Thermal anomalies appeared in the area for the first time during the first week of December 2015; weak fumarolic activity accompanied by H2S odors were first reported during 15-17 December 2015 on the SW side of the Iwo-yama crater (figure 52). Figure 51. No surface activity, and very little thermal activity was present at the Iwo-yama (Ebino Kogen) area of Kirishimayama on 2 November 2015. View is to the N, taken from the N flank of Karakunidake. Courtesy of JMA (JMA Kirishimayama annual report, Heisei 27 (2015)). Figure 52. 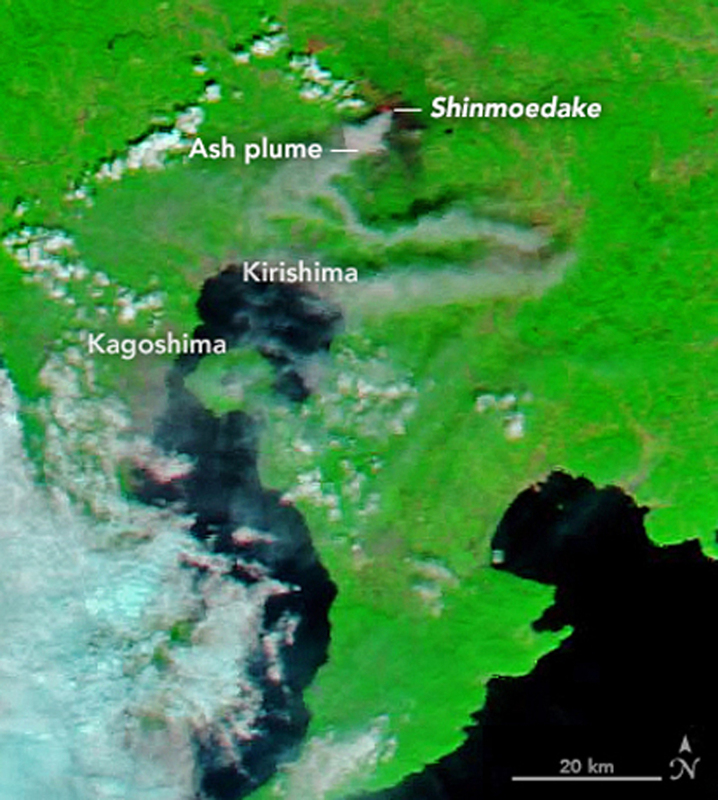 Steam plumes and a thermal anomaly at the Iwo-yama area of Kirishimayama first appeared during December 2015 (images from 28 December 2015, view to the S). Courtesy of JMA (JMA Kirishimayama annual report, Heisei 27 (2015)). Periods of intermittent microtremor activity occurred once in January, four times in February, and twice in December during 2016, with durations ranging from 40 seconds to 5 minutes. A seismic swarm on 28 February led JMA to raise the unofficial Alert Level to "danger around the crater" for the month of March (equivalent to the official Alert Level 2). A new thermal area with fumarolic activity appeared on 24 March 2016 on the SE side of the crater. Intermittent steam plumes were observed throughout 2016; the highest rose 200 m on 11 October. Thermal anomalies also persisted throughout the year on the S and SW areas of the crater. Alert Level 1 (Note that it is an active volcano) was formally assigned to Iwo-yama on 6 December 2016. The Alert Level was raised to 2 on 12 December after a seismic swarm, tremor, and the observation of inflation in the inclination data in the previous days. Fumarolic activity decreased in January 2017 after a brief increase at the end of December 2016; JMA lowered the Alert Level back to 1 on 13 January and steam plumes generally rose only 30 m high during the month. The thermal anomalies persisted in the same areas of the SW and W portions of the crater as before, though new fumarolic activity appeared in those areas during February 2017. During March field surveys, observers identified hot water emerging from the fumaroles in the SW and S areas of the crater. The inclinometer detected inflation beginning on 25 April 2017, but it leveled off during August. 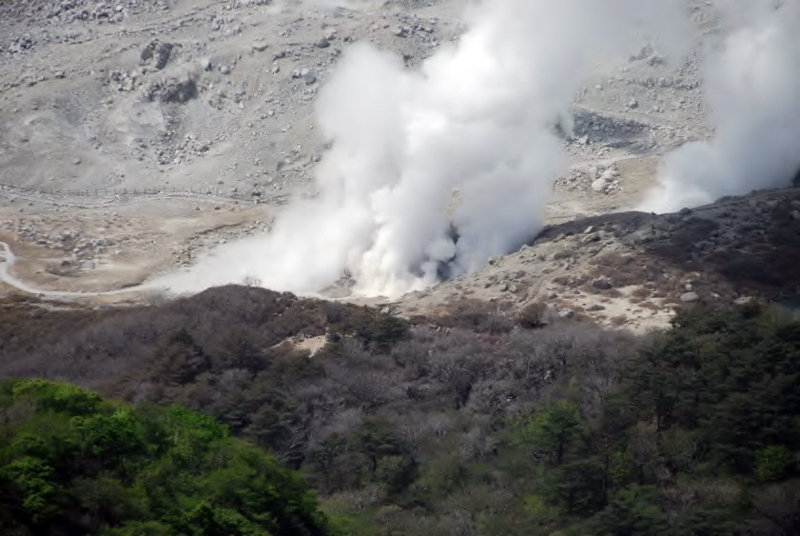 An increase in the number of fumaroles in the area of the thermal anomaly at the SW side of the crater was confirmed by a JMA field inspection in late April. When the University of Tokyo Earthquake Research Institute visited the site on 8 May 2017, they observed sediment-laden water deposits that had been dispersed on the SW side within the crater, and ejecta around the SW edge. This led JMA to increase the Alert Level to 2. Fumarolic activity increased during mid-to-late July 2017 and steam plumes were reported at 300 m above the crater for a brief period. On 27 July visitors confirmed dead and discolored plants on the NE side of the crater, and audible fumarolic activity. A new thermal anomaly zone with fumaroles was visible on the SW flank outside the crater during a site visit on 31 August. Low levels of seismicity were intermittent throughout 2017, but no tremor events were recorded. A large amplitude earthquake with its epicenter under Iwo-yama occurred on 5 September 2017; no sudden changes were observed at the site a few days later, although thermal images taken on 9 September revealed an increase in temperature from two years prior (figure 53, compared with figure 52). JMA lowered the warning level to 1 at the end of October. 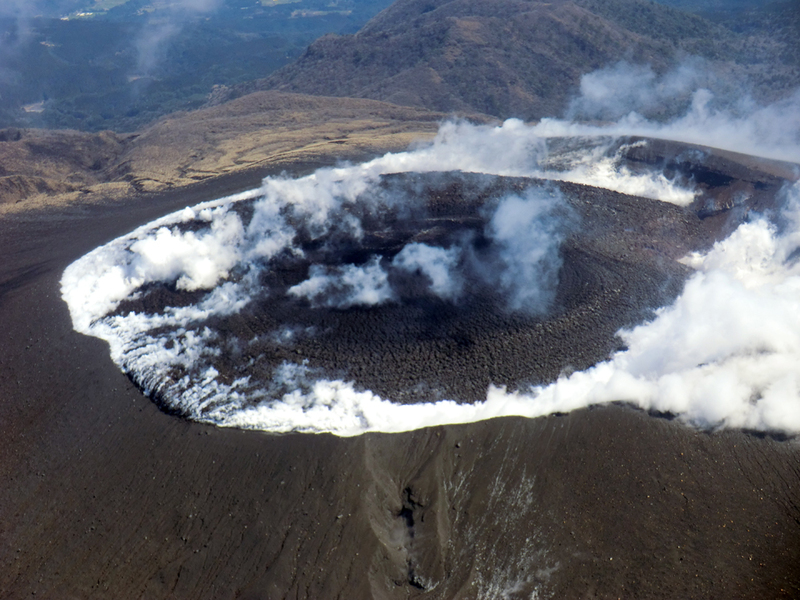 During November and December 2017, steam plumes generally rose 100-200 m above the crater. Figure 53. 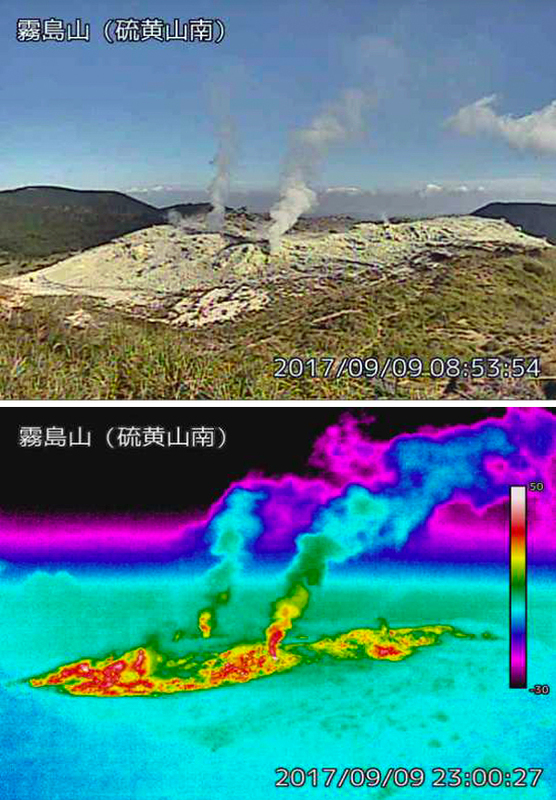 Steam plumes and a thermal anomaly persisted into September 2017 at the Iwo-yama crater of Kirishimayama. Emissions of the plume on the left were audible during the July visit. Compare with the lower temperatures measured in December 2015, figure 52. Image taken on 9 September 2017 from the Iwomayama South webcam on the S side of the area. Courtesy of JMA (JMA Kirishimayama annual report, Heisei 29 (2017)). Activity at Iwo-yama during January-May 2018. 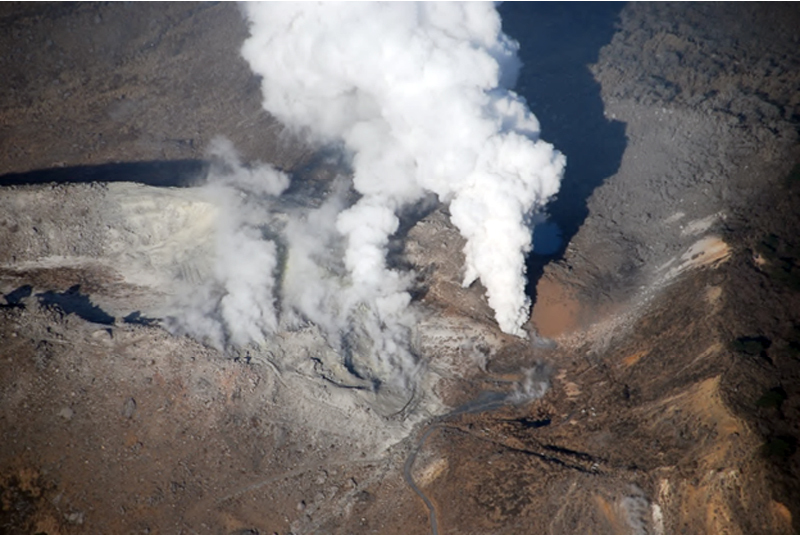 An analysis of nearby hot-spring waters indicated a significant jump in Cl/SO4 ratios characteristic of high-temperature volcanic gas beginning in November 2017. The first tremor since 12 December 2016 was recorded on 19 January 2018 and coincided with a brief period of inflation in the vicinity of Iwo-yama. Regional inflation of the area had begun again in July 2017 and continued into 2018. Low-frequency, small-amplitude earthquakes were intermittent during January 2018 and steam plumes rose 100-200 m. Increases in seismicity, fumarolic activity, and the temperatures of the thermal anomalies during mid-February 2018 prompted JMA to raise the Alert Level on 20 February 2018 at Iwo-yama to 2. Steam plume heights increased to 200-300 m after 20 February. Seismicity decreased during March 2018, however observations from the webcam revealed an increase in fumarolic and thermal activity (figure 54). Figure 54. Fumarolic activity and heatflow increased at the Iwo-yama crater of Kirishimayama during March 2018, with steam plumes at the central vent rising several hundred meters. Images taken on 23 March 2018. View is to the N from the Iwo-yama south webcam. Courtesy of JMA (Volcanic activity commentary on Kirishimayama, March, Heisei 30 (2018)). The infrared imaging webcam recorded a burst of heat from a vent on the SW side of the crater on 7 April; the amplitude of seismic vibrations also increased. A field visit on 9 April revealed a hot water pool several meters in diameter on the SW side of the crater with sediment-laden water flowing from it and a 10-m-high steam plume. Local inflation recorded at Iwo-yama turned to deflation on 19 April; large-amplitude earthquakes were also reported. A tremor that day was followed by an explosion a few minutes later from a new vent on the S side of Iwo-yama. The plume rose 500 m and ejecta was scattered 200-300 m from the vent to the SE. During an overflight on 19 April JMA noted ash deposits around the vent; ash emission from the vent continued until the following morning (figure 55). The Tokyo VAAC reported a small ash emission on 19 April from Kirishimayama that rose to 1.8 km altitude and drifted E, but it was not visible in satellite imagery. On the evening of 20 April, another new vent with a vigorous steam plume appeared 500 m W of Iwo-yama (figure 56). Sediment-laden water was observed around the vent the following day. Increased seismicity at Iwo-yama lasted for about 20 days; additional tremor activity was reported on 20 and 24 April. Figure 55. An explosion sent steam and ash 500 m high, and ejecta 200-300 m SE from a new vent on the S side of Iwo-yama on 19 April 2018 at Kirishimayama. Ash emission continued until the following morning. N is to the left, fresh ash deposits cover the area SE of the new vent (upper right). Courtesy of JMA (Volcanic activity commentary on Kirishimayama, April, Heisei 30 (2018)). Figure 56. A new fumarole with a vigorous steam plume appeared about 500 m W of Iwo-yama during the evening of 20 April 2018. N is to the left. Miyazaki Prefecture Disaster Preparedness Emergency Air Corps Photograph taken from a helicopter on 21 April 2018. Courtesy of JMA (Volcanic activity commentary on Kirishimayama, April, Heisei 30 (2018)). A brief explosion that lasted about ten minutes occurred from this new vent around 1815 on 26 April 2018 sending a plume of ash about 200 m above the vent (figure 57). A small ash emission from Kirishimayama was reported by the Tokyo VAAC on 26 April that rose to 1.5 km altitude. 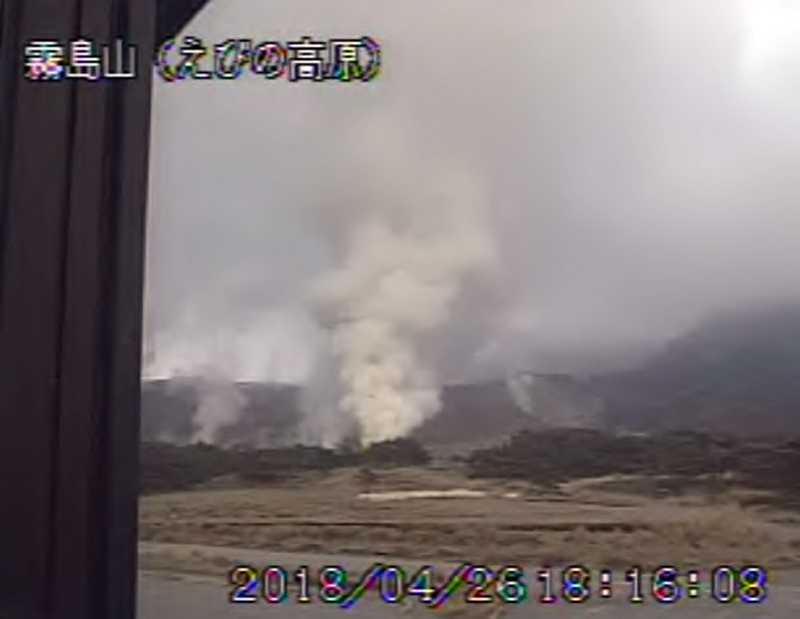 In a site visit on 30 April, JMA noted active fumaroles and small explosions around both vent areas (figure 58). After the explosion of 19 April, steam plumes rose as high as 700 m from the vent on the S side of the crater, and intermittent spouts a few meters high of sediment-laden water were also observed. Steam plumes rose as high as 500 m from the vent located 500 m to the W.
Figure 57. An explosion from the new vent located 500 m W of Iwo-yama at Kirishimayama on 26 April 2018 sent ash 200 m above the vent. Courtesy of JMA (Volcanic activity commentary on Kirishimayama, April, Heisei 30 (2018)). Figure 58. Vigorous steam plumes rose from both the S side vent at Iwo-yama (background) and the new vent 500 m W (foreground) on 30 April 2018 at the Kirishimayama complex. North is to the left. Courtesy of JMA (Volcanic activity commentary on Kirishimayama, April, Heisei 30 (2018)). Fumarolic activity continued at Iwo-yama during May 2018, but no new explosions nor ash emissions were reported. Shallow seismic events were intermittent, but significantly decreased from April. No tremors were recorded. JMA lowered the Alert Level on 1 May 2018 from 3 to 2. Steam plumes rose 300-500 m from the vents, and thermal anomalies persisted at the crater and the adjacent new vent to the W throughout the month. Jets of sediment-laden hot water rising several meters continued from the vent on the S side of Iwo-yama (figure 59). Figure 59. Jets of sediment-laden hot water (gray spout at center) rose several meters from the S vent at Iwo-Yama at Kirishimayama during May 2018. Image taken on 15 May 2018. Courtesy of JMA (Volcanic activity commentary on Kirishimayama, April, Heisei 30 (2018)). Information Contacts: Japan Meteorological Agency (JMA), Otemachi, 1-3-4, Chiyoda-ku Tokyo 100-8122, Japan (URL: http://www.jma.go.jp/jma/indexe.html); NASA Goddard Space Flight Center (NASA/GSFC), Global Sulfur Dioxide Monitoring Page, Atmospheric Chemistry and Dynamics Laboratory, 8800 Greenbelt Road, Goddard, Maryland, USA (URL: https://so2.gsfc.nasa.gov/); NASA Earth Observatory, EOS Project Science Office, NASA Goddard Space Flight Center, Goddard, Maryland, USA (URL: http://earthobservatory.nasa.gov/); MIROVA (Middle InfraRed Observation of Volcanic Activity), a collaborative project between the Universities of Turin and Florence (Italy) supported by the Centre for Volcanic Risk of the Italian Civil Protection Department (URL: http://www.mirovaweb.it/); Hawai'i Institute of Geophysics and Planetology (HIGP) - MODVOLC Thermal Alerts System, School of Ocean and Earth Science and Technology (SOEST), Univ. of Hawai'i, 2525 Correa Road, Honolulu, HI 96822, USA (URL: http://modis.higp.hawaii.edu/); Geographical Survey Institute, Geospatial Information Authority of Japan, Ministry of Land, Infrastructure, Transport and Tourism, No. 1 North Town, Tsukuba city, Ibaraki Prefecture 305-0811 Japan Tel: 029-864-1111 (Representative) Fax: 029-864-1807 (URL: http://www.gsi.go.jp/index.html); Kyodo News (URL: https://www.kyodonews.jp/english/); Associated Press (URL: http://www.ap.org/ ); Reuters (http://www.reuters.com/). Kirishimayama is a large group of more than 20 Quaternary volcanoes located north of Kagoshima Bay. The late-Pleistocene to Holocene dominantly andesitic group consists of stratovolcanoes, pyroclastic cones, maars, and underlying shield volcanoes located over an area of 20 x 30 km. The larger stratovolcanoes are scattered throughout the field, with the centrally located Karakunidake being the highest. 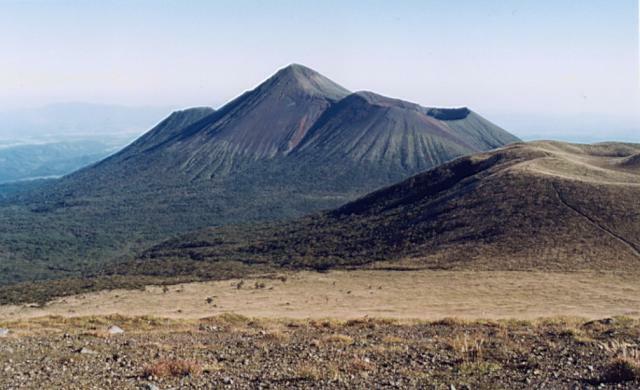 Onamiike and Miike, the two largest maars, are located SW of Karakunidake and at its far eastern end, respectively. Holocene eruptions have been concentrated along an E-W line of vents from Miike to Ohachi, and at Shinmoedake to the NE. Frequent small-to-moderate explosive eruptions have been recorded since the 8th century. Imura R, Kobayashi T, 1991. Eruptions of Shinmoedake volcano, Kirishima volcano group, in the last 300 years. Bull Volc Soc Japan (Kazan), 36: 135-148 (in Japanese). Inoue K, 1988. The growth history of Takachiho composite volcano in the Kirishima volcano group. Ganko (Petr Min), 83: 26-41 (in Japanese with English abs). Kobayashi T, Aramaki S, Watanabe T, Kamada M, 1981. Kirishima volcano. In: Kubotera A (ed) Symp Arc Volc Field Excur Guide to Sakurajima, Kirishima and Aso Volcanoes, Part 2, Tokyo: Volc Soc Japan, p 18-32. Tsukui M, Okuno M, Kobayashi T, 2007. 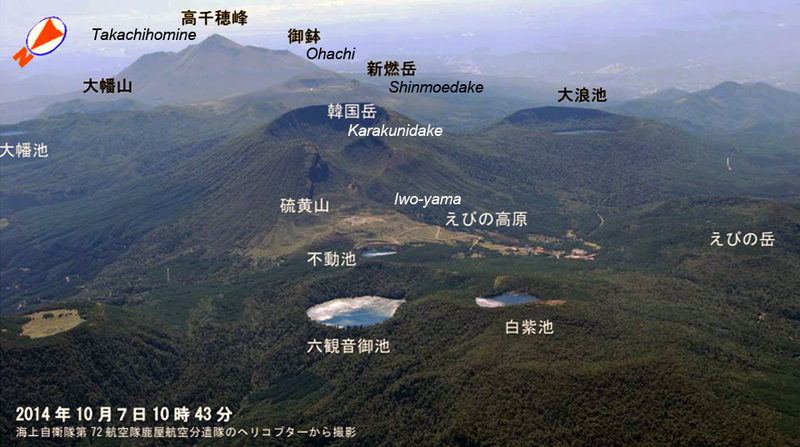 Eruptive history of Ohachi volcano, Kirishima volcano group, southern Kyushu, Japan. Bull Volc Soc Japan (Kazan), 52: 1-21 (in Japanese with English abs). [ 1946 Apr ] [ Unknown ] Uncertain 2 Karakuni-dake ? Remarks: Alternating inflation and deflation cycles were recorded during the eruption of Shinmoe-dake volcano in 2011. Reference List: Takeo et al. 2013. Remarks: InSAR data show uplift of 2-4 cm in the Shinmoedake area before and during the 2011 eruption. Reference List: Nobile et al. 2013*; Miyagi et al. 2013*. Miyagi, Y., Ozawa, T., Kozono, T., and Shimada, M., 2013. DInSAR/PSInSAR Observations of Kirishima, Shinmoe-dake Volcano, Japan. EGU General Assembly abstract EGU2013-4658. Nobile, A., D. Trippanera, S. Pepe, F. Casu, P. Tizzani, J. Ruch, Y. Aoki, N. Geshi, V. Acocella, E. Sansosti, V. Siniscalchi, S. Borgstrom, S. Zoffoli, 2013. 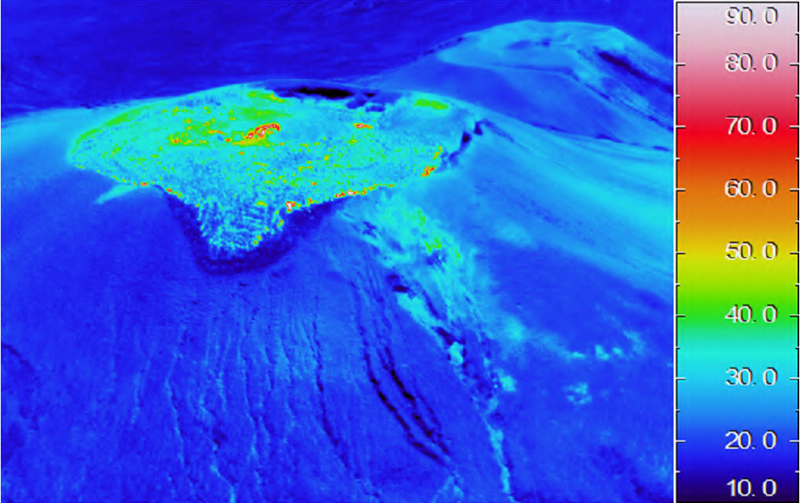 Volcano deformation in Kyushu (SW Japan) through InSAR data. (abstract 1A1_2D-O2), Prseented at the IAVCEI 2013 Scientific Assembly, Kagoshima, Japan. 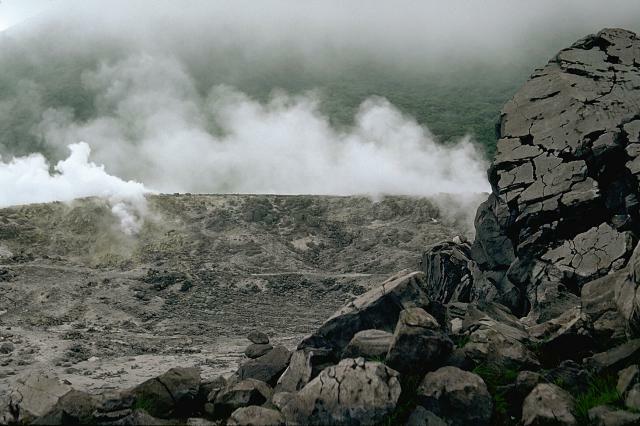 Steam rises from Iwo-yama ("Sulfur Mountain"), one of the largest thermal areas of the Kirishima volcano group. The Iwo-yama thermal area is located between Karakuni-dake stratovolcano and Rokannon-Mi-ike maar in the NW part of the volcanic field. 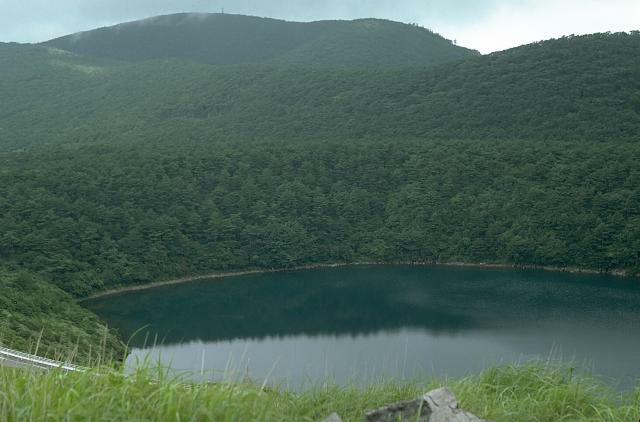 Lake-filled Rokkannon-Mi-ike is one of several maars in the Kirishima volcano group. It is located NW of Karakuni-dake in the NW part of the Kirishima group. The forested rim of the maar cuts horizontally across the center of the photo; the peak behind it is Shiratori-yama, a small stratovolcano. Lake-filled Rokkannon-Mi-ike, its rim traversed by a highway, is one of several maars at Kirishima volcano. The Kirishima volcano group consists of stratovolcanoes, pyroclastic cones, maars, and underlying shield volcanoes scattered over a 20 x 30 km area north of Kagoshima Bay. Numerous small-to-moderate explosive eruptions have been recorded at Kirishima since the 8th century. Photo by Yukio Hayakawa (Gunma University). Sharp-peaked Takachiho-mine (center) is the 2nd highest peak of the Kirishima volcanic complex. It is flanked on the east (right) by Ohachi, with its broad summit crater. Madu-dake is the grass-covered cone at the far right. Kirishima is a large group of more than 20 Quaternary volcanoes that is the centerpiece of Kirishima National Park, located north of Kagoshima Bay. The late-Pleistocene to Holocene group of stratovolcanoes, pyroclastic cones, maars, and underlying shield volcanoes occupies an area of 20 x 30 km. There are no samples for Kirishimayama in the Smithsonian's NMNH Department of Mineral Sciences Rock and Ore collection. Large Eruptions of Kirishimayama Information about large Quaternary eruptions (VEI >= 4) is cataloged in the Large Magnitude Explosive Volcanic Eruptions (LaMEVE) database of the Volcano Global Risk Identification and Analysis Project (VOGRIPA).